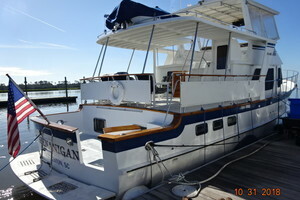 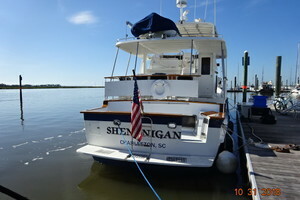 Shenanigans is a stabilized 2000 49' DeFever Cockpit Motoryacht, also known as a 44+5 model. 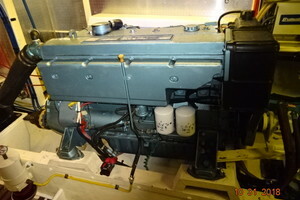 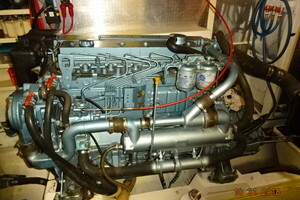 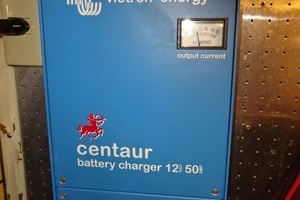 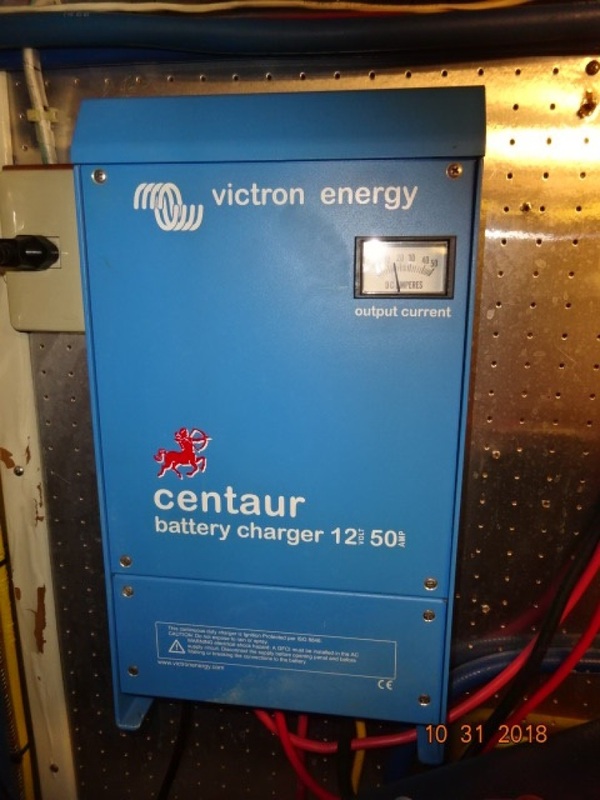 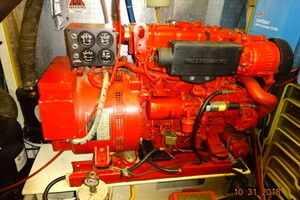 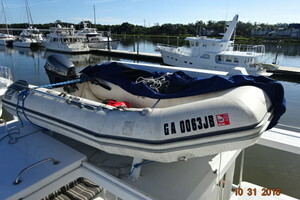 She is in good condition and turn-key for her next owner. 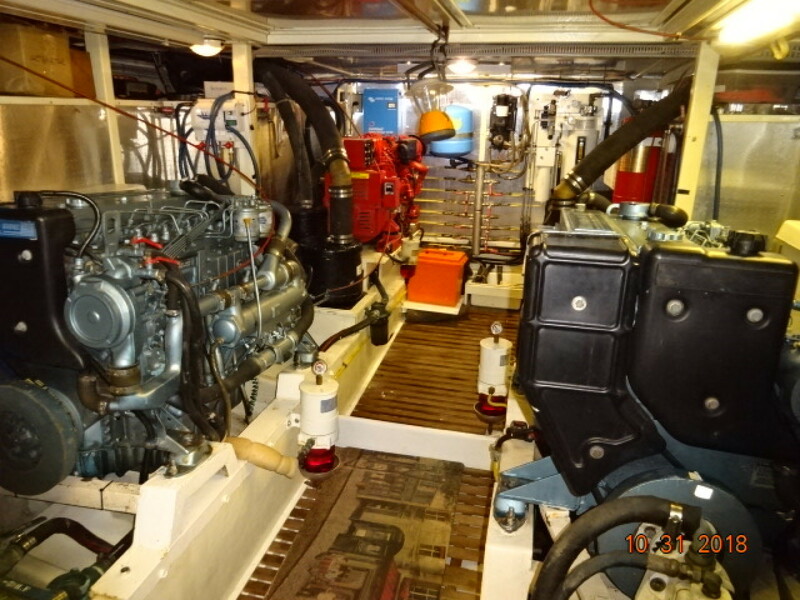 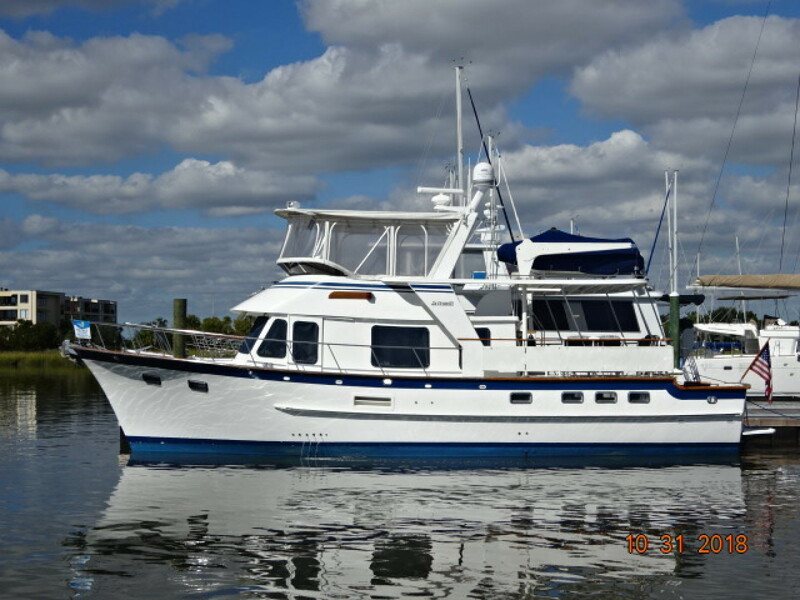 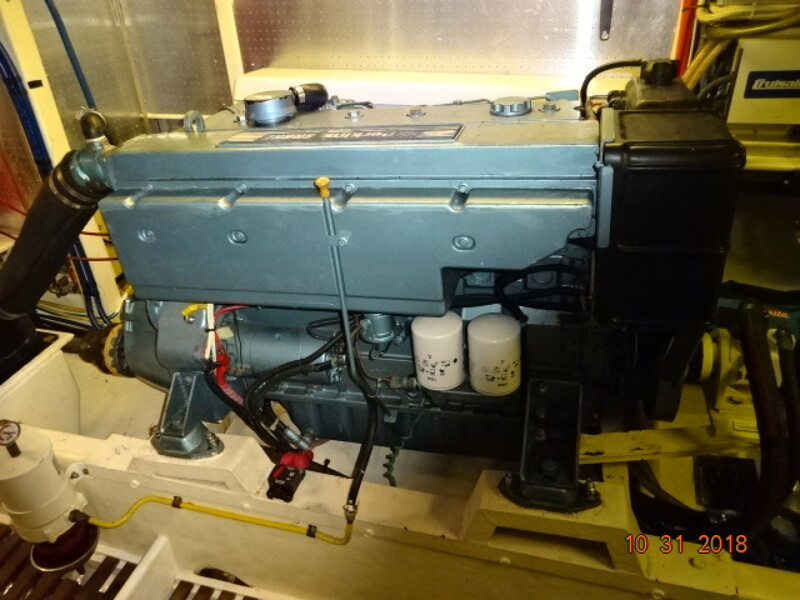 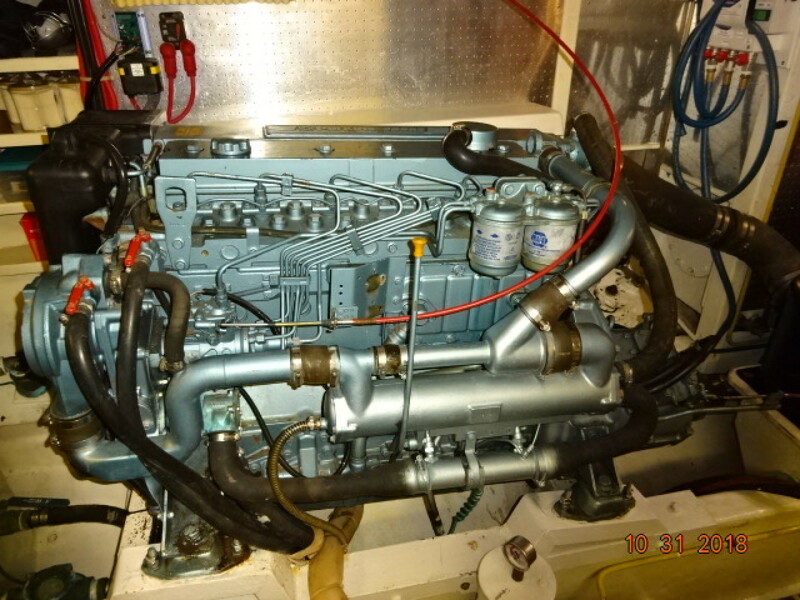 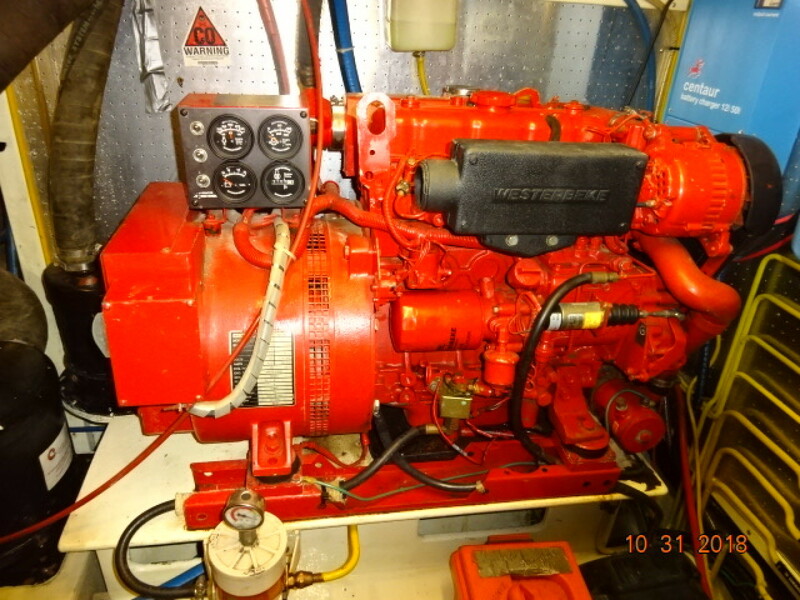 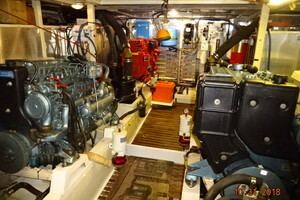 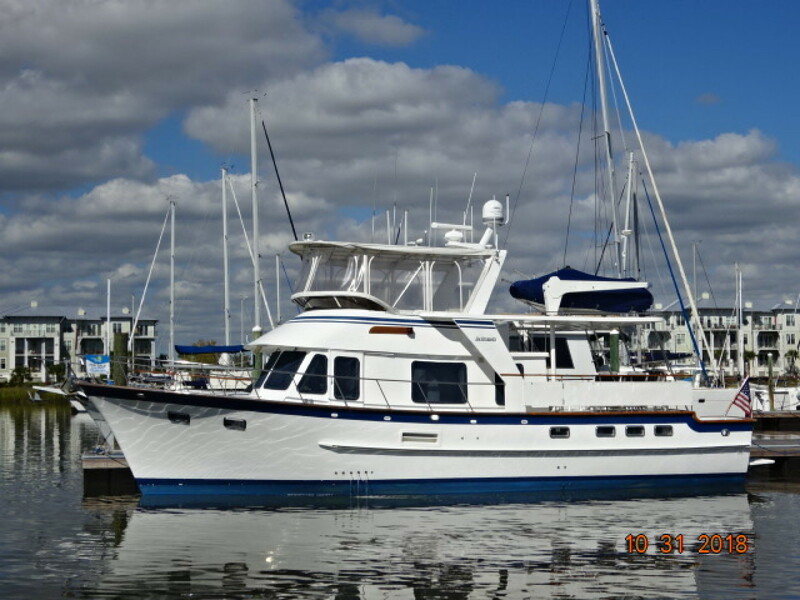 She offers twin Perkins Sabre 135 hp naturally aspirated main engines, 12.5 kW Westerbeke generator, Vetus bowthruster, Naiad stabilizers, oil change system, Magnum 2800 watt inverter, very popular cockpit-sundeck-flybridge design and a clean, uncluttered interior. 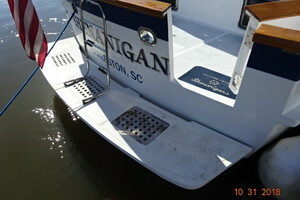 Shenanigans is Great Loop capable. 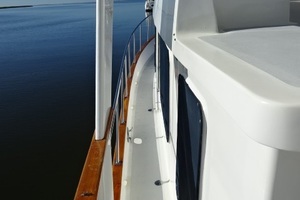 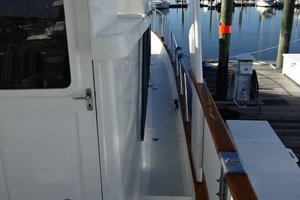 From the swimplatform, you enter the cockpit via the transom door and then walk up several steps onto the sundeck. 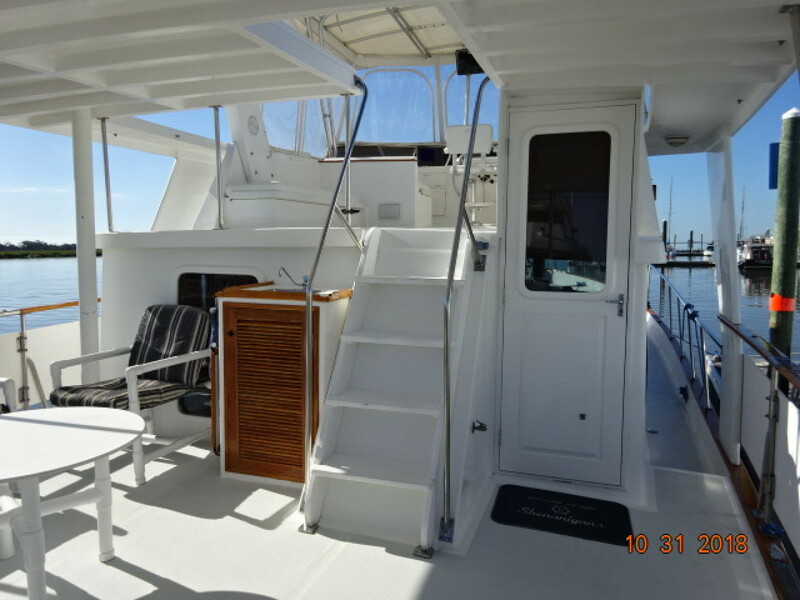 From the sundeck, you can walk out either side deck, step up several steps to the flybridge or enter the salon via the full height doorway. 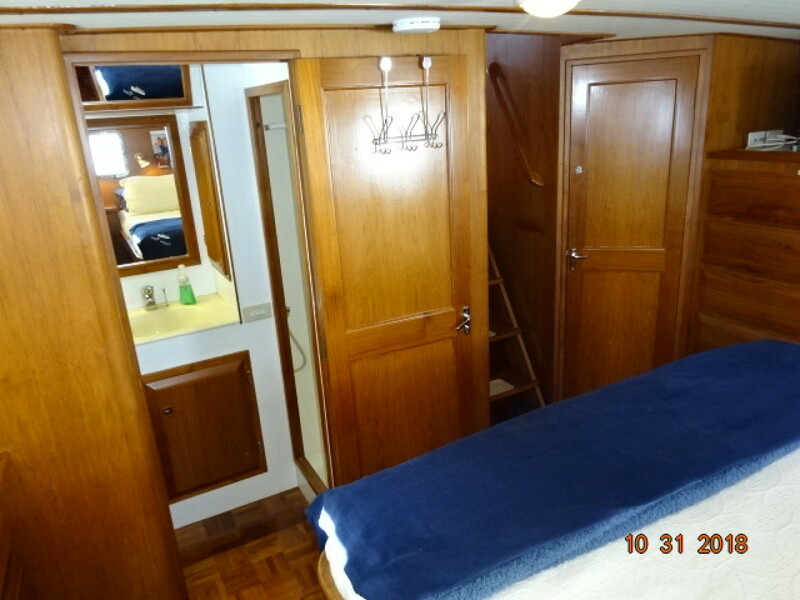 Once inside the salon, you will find the galley port aft, built-in settee and table to port and a port side deck access door forward. 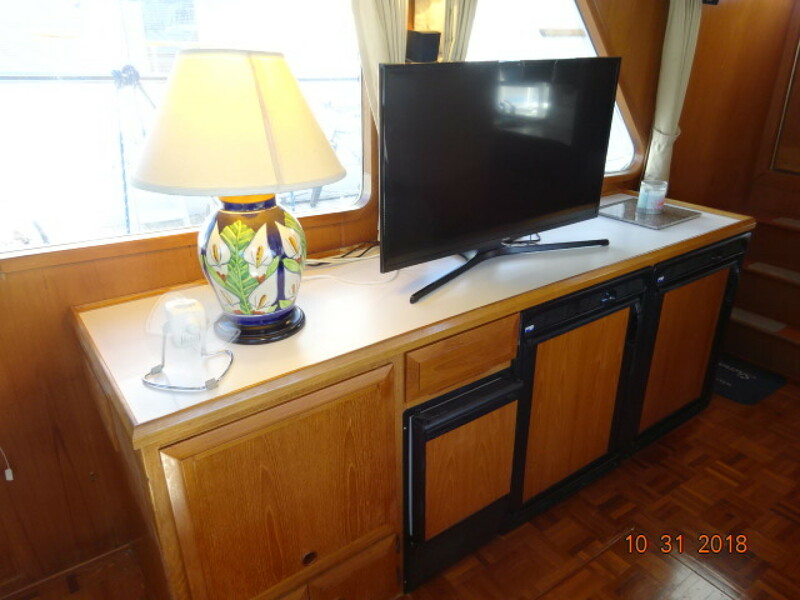 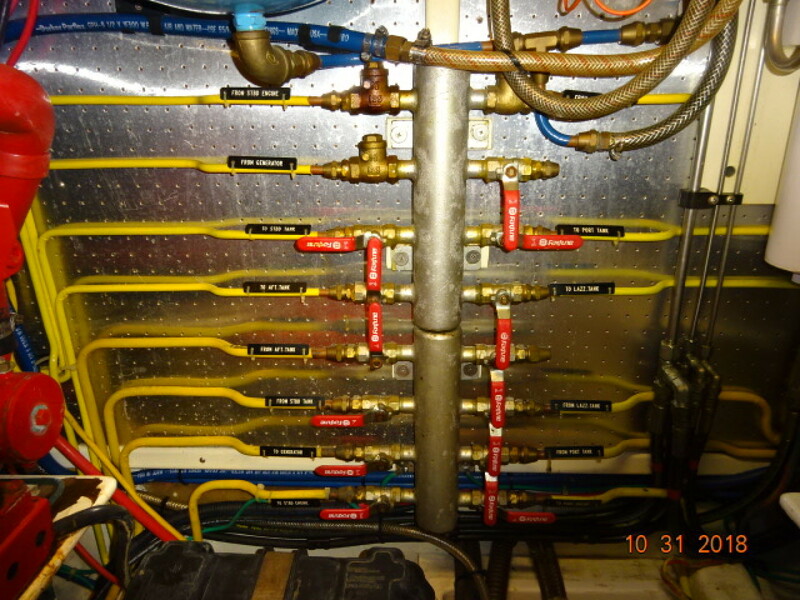 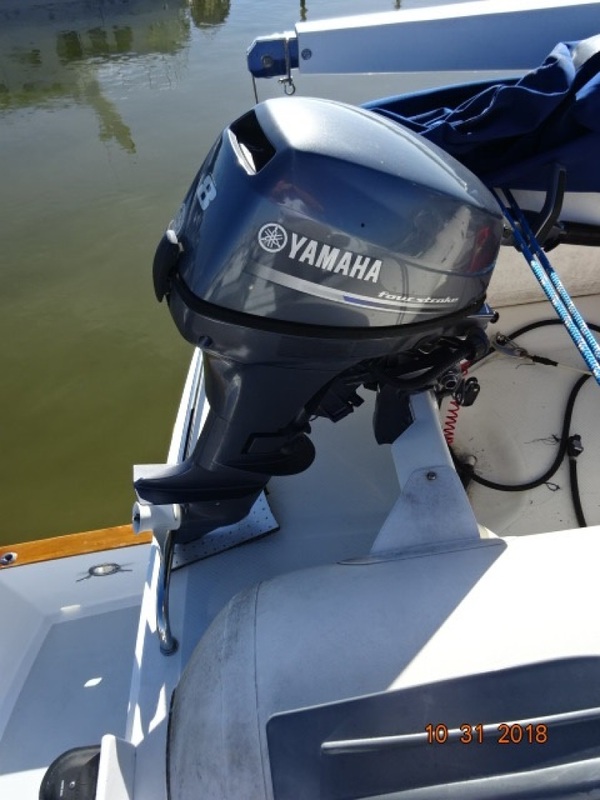 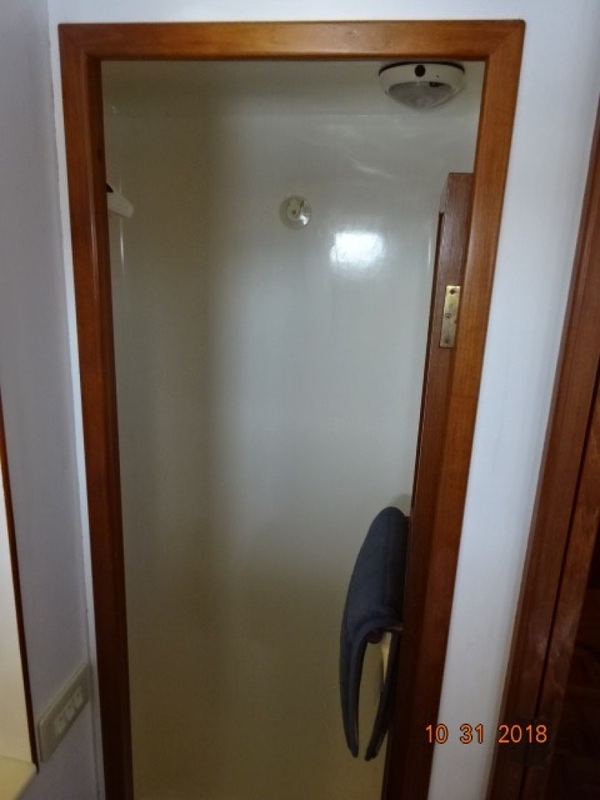 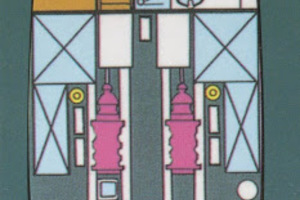 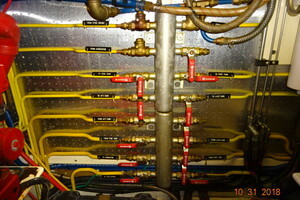 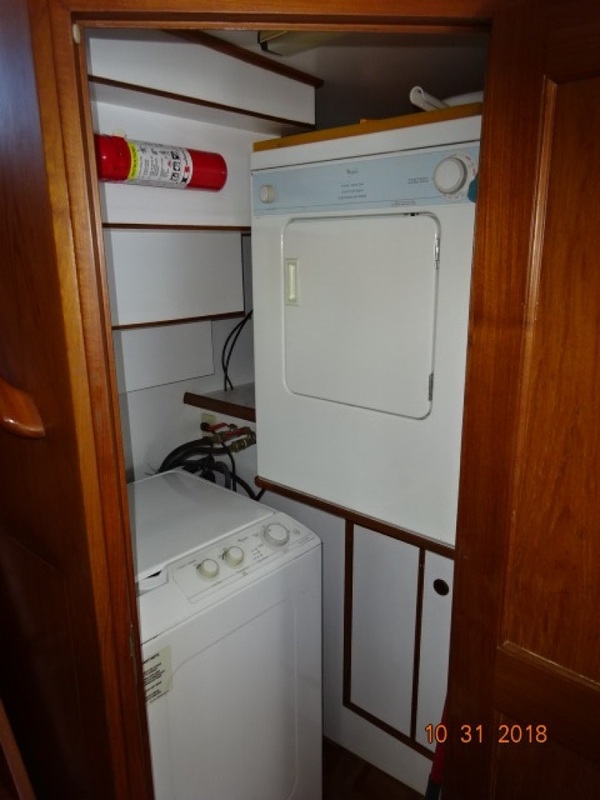 There is cabinetry to starboard and then the lower helm starboard forward. 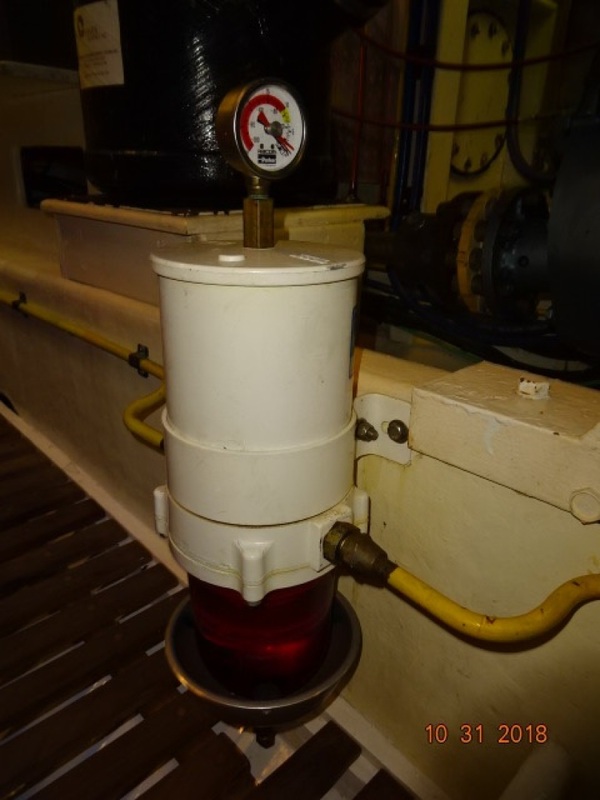 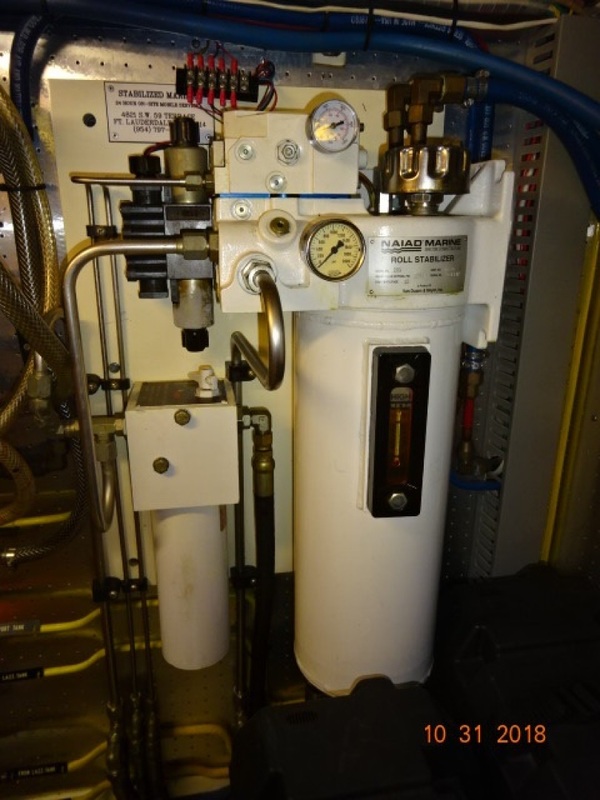 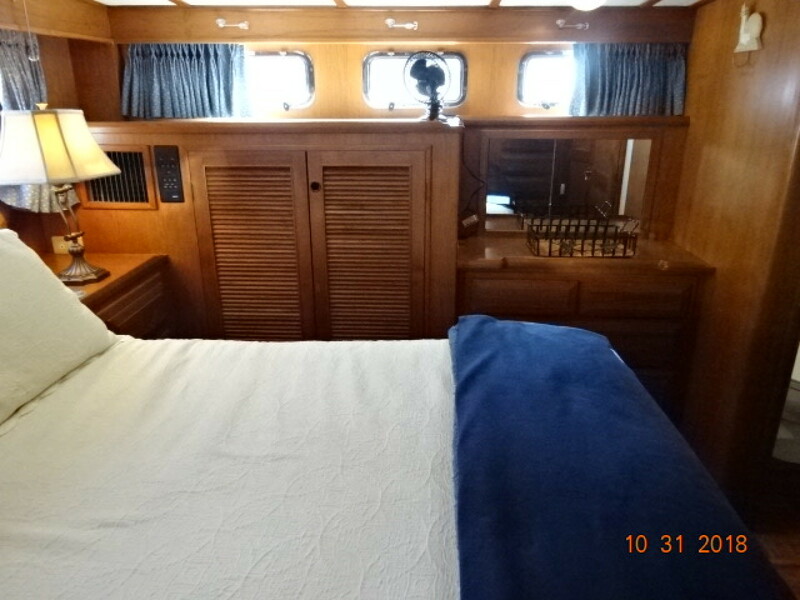 Then step down forward into the guest stateroom and the stand up engine room or walk aft and step down into the full-beam master stateroom. 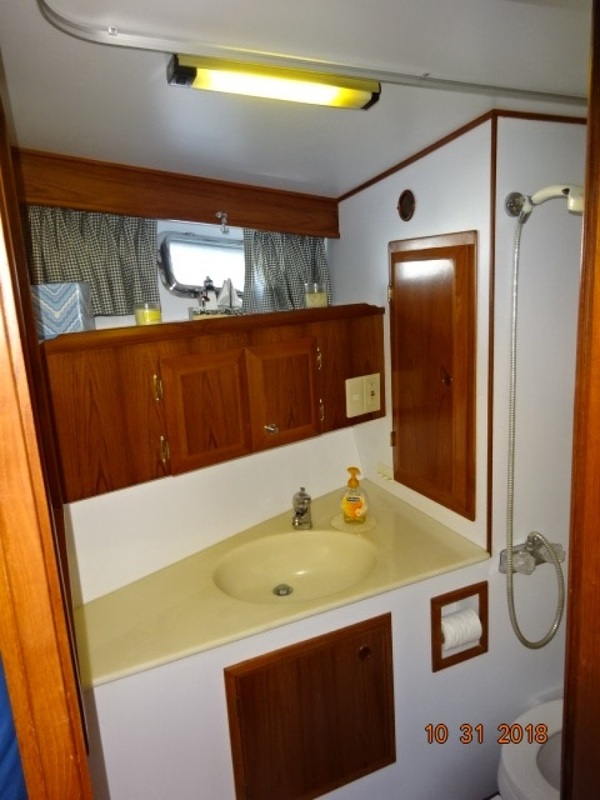 The headroom in the salon is 6'5", 6'6" in the guest stateroom and the guest shower, 6'4" in the master stateroom and 6'5" in the master shower, 5'6" in the engine room, 6'4" in the sundeck and 7'2" on the flybridge. 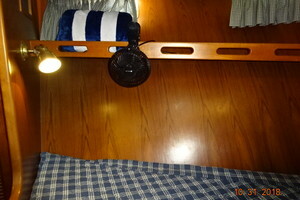 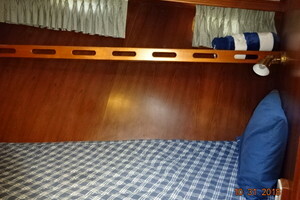 the master stateroom berth is 6'6" long and the guest stateroom berths are 6'7" long. 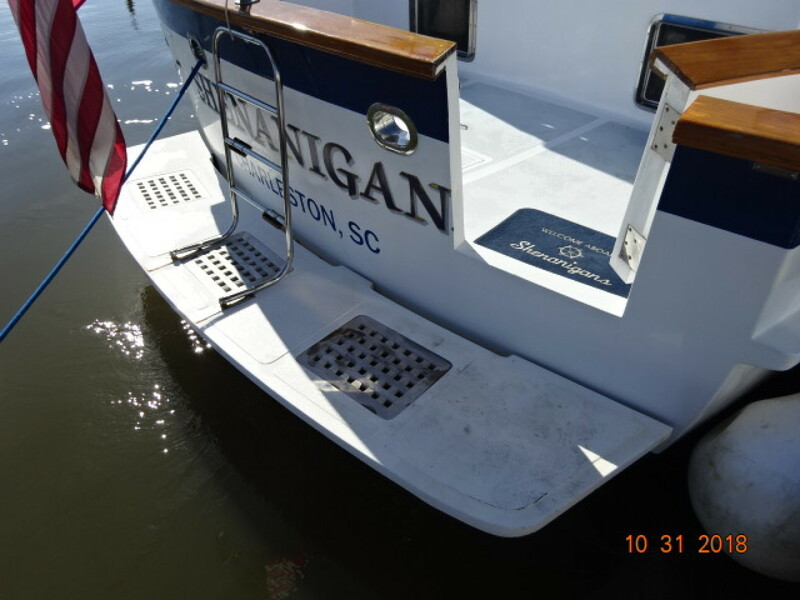 Shenanigans offers a full beam aft master stateroom with ensuite head and a forward guest stateroom with v-berth and insert and ensuite head. 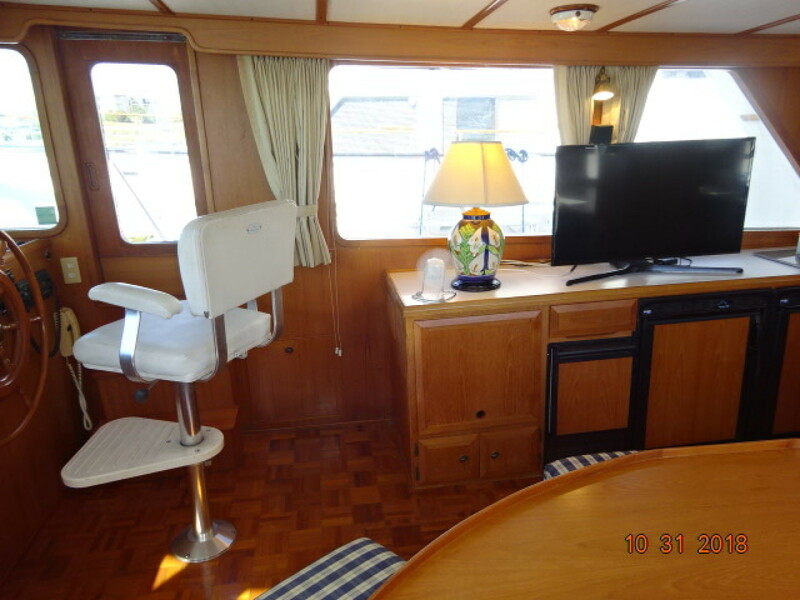 The 49' DeFever offers a huge salon with built-in seating with storage, two stools, lounge chair and a hi/lo teak table to port, cabinetry to starboard, side deck access doors on each side, teak parquet sole, large side windows with curtains and reading lights. 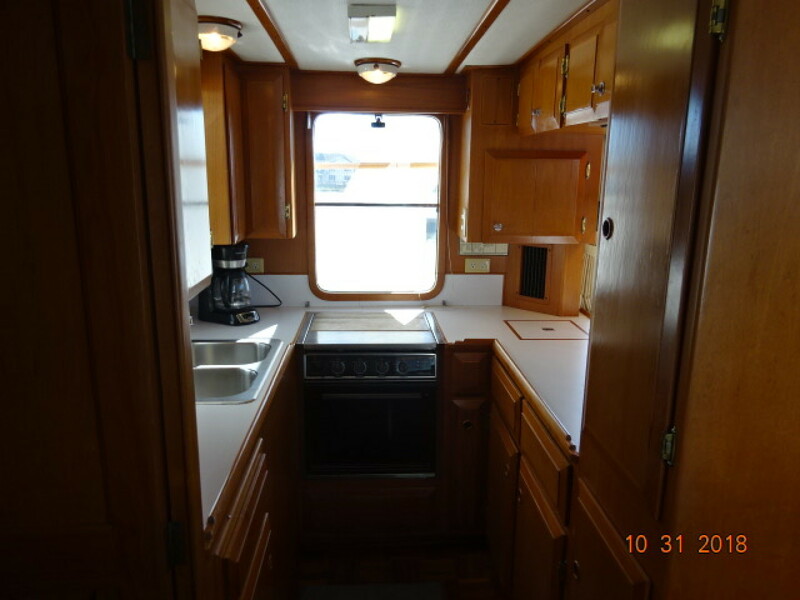 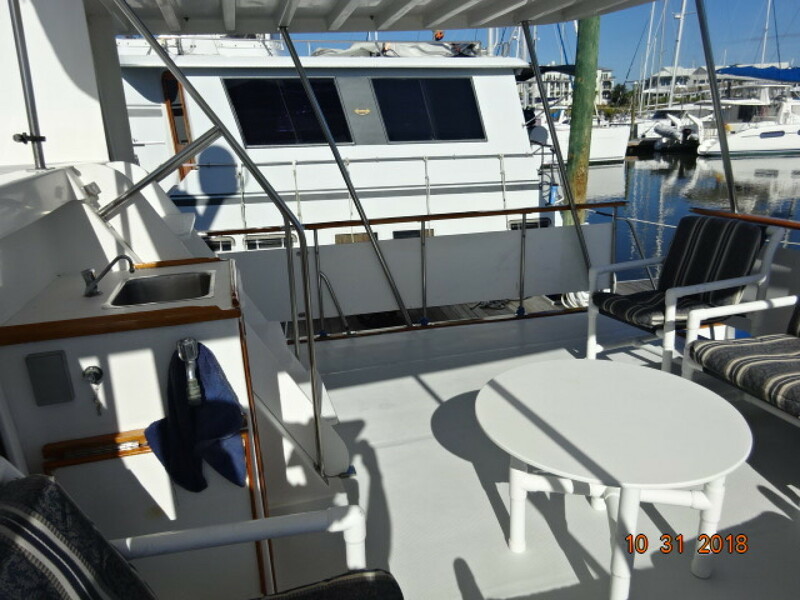 The galley is located port aft in the salon and offers opening side and aft windows for plenty of natural light and ventilation. 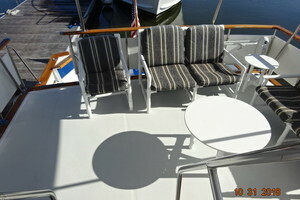 Dining space is available at the salon hi/lo teak table. 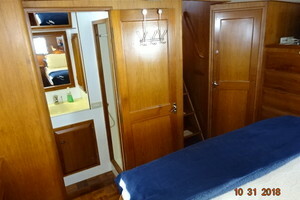 drapes, hanging lockers, storage cabinets and drawers, teak parquet sole and ensuite head with enclosed shower. 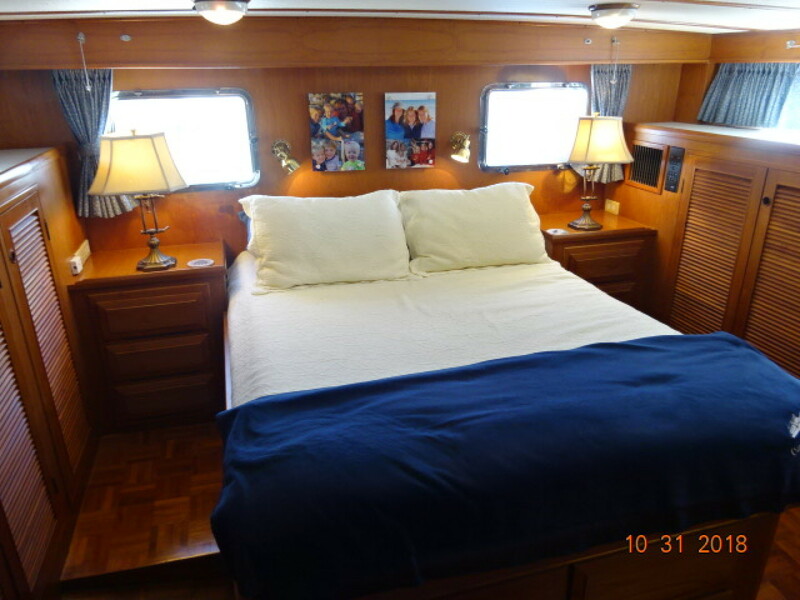 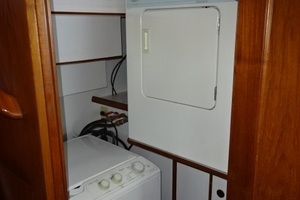 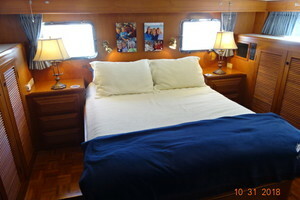 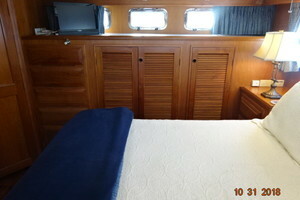 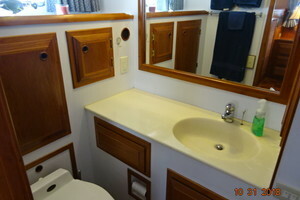 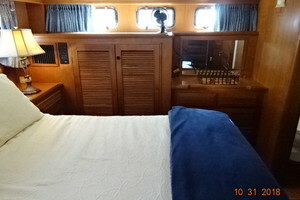 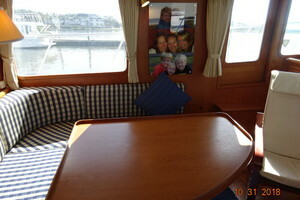 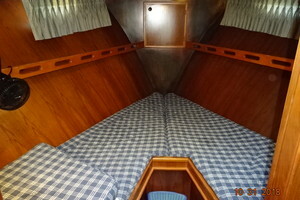 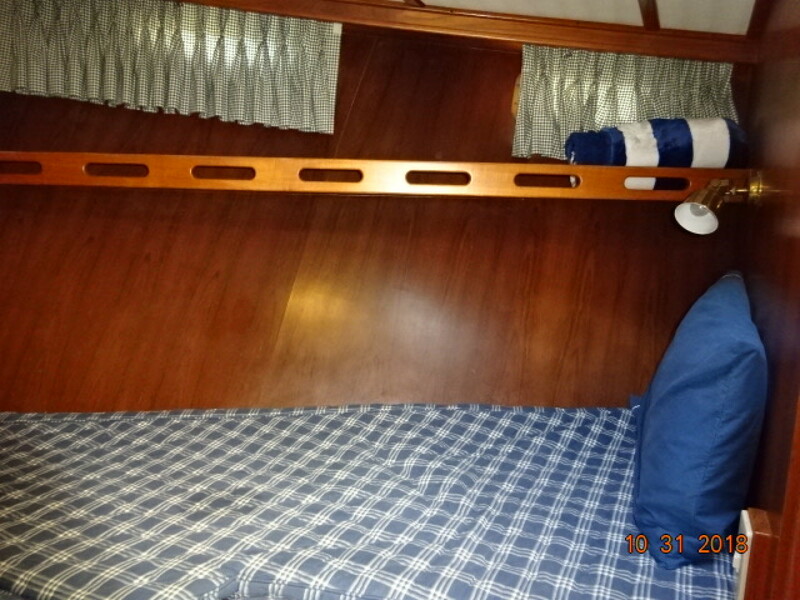 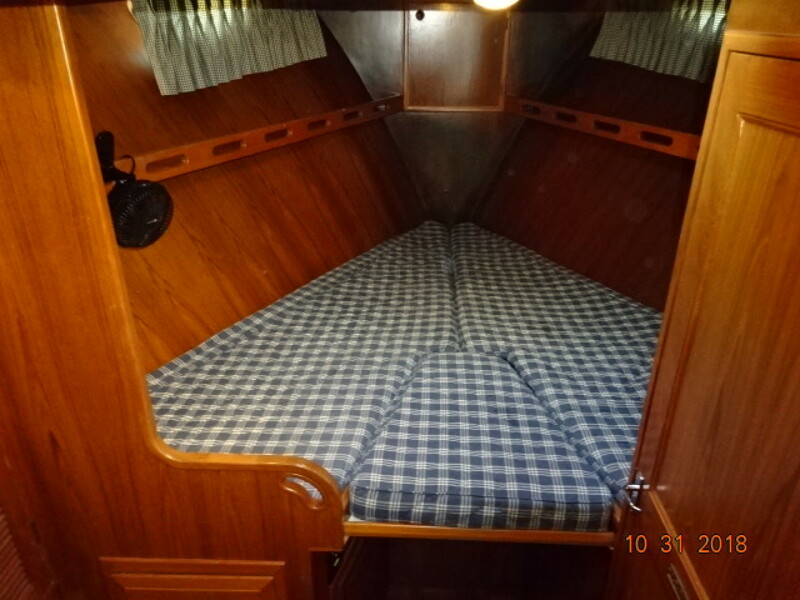 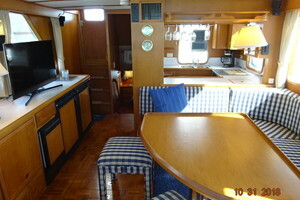 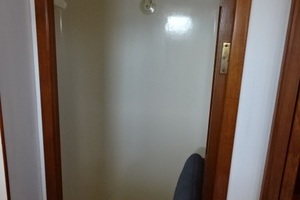 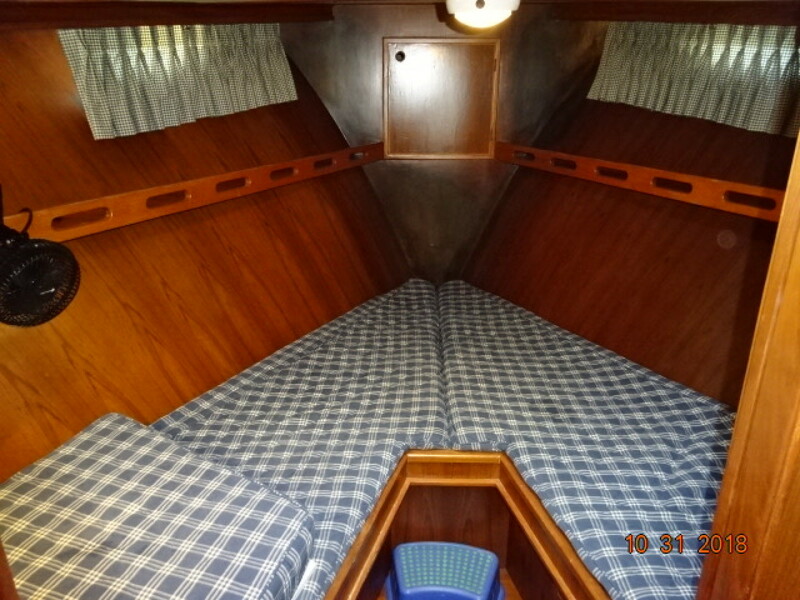 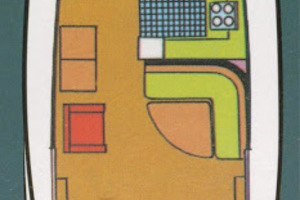 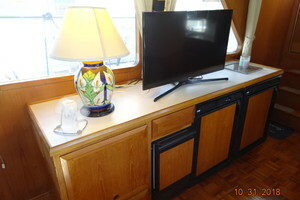 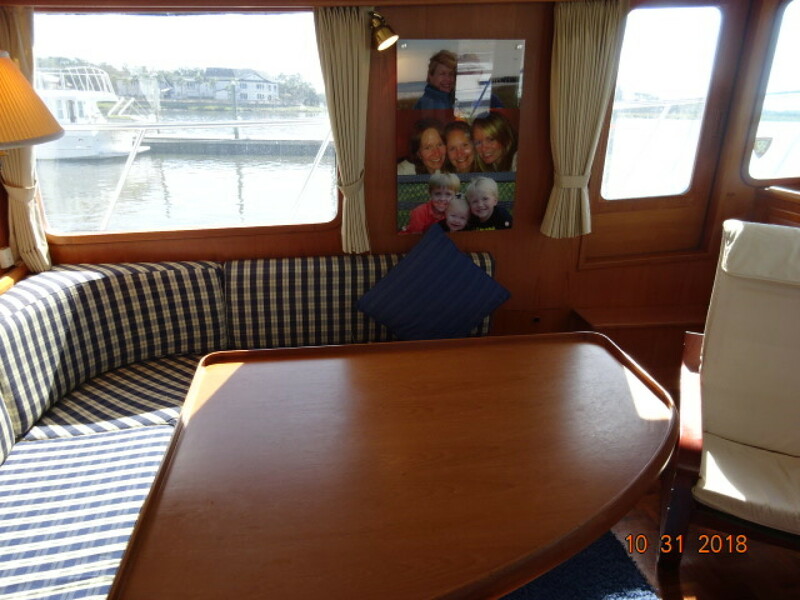 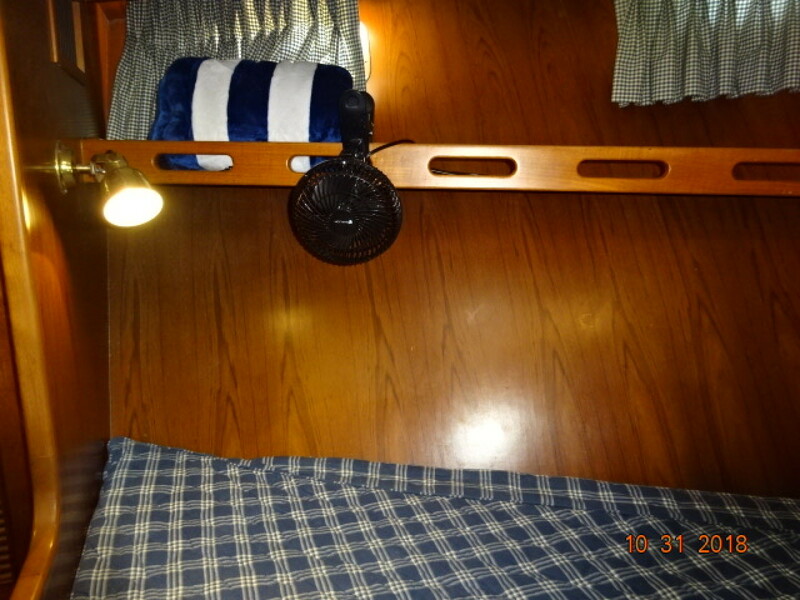 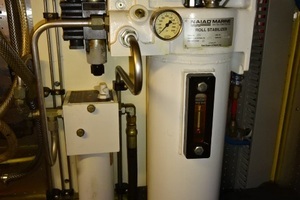 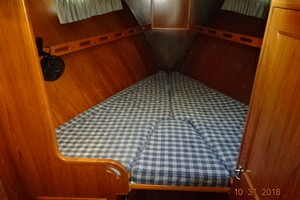 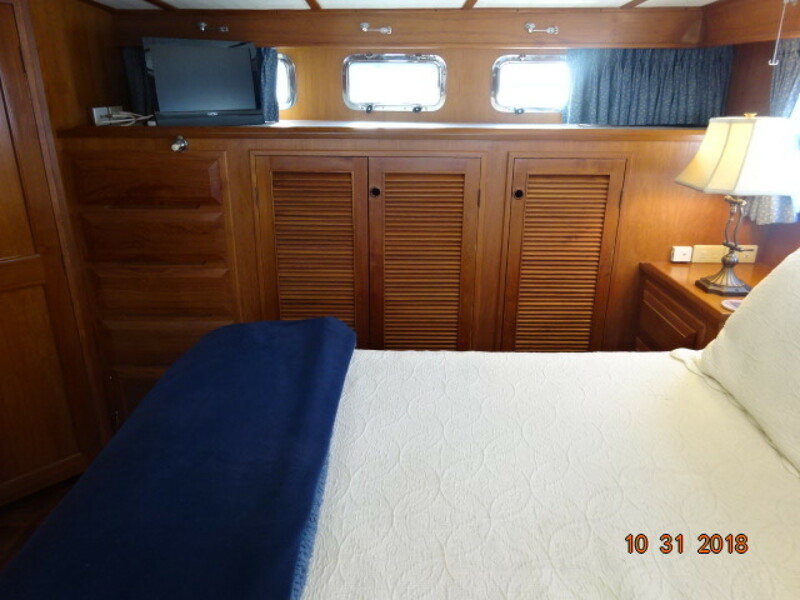 The guest stateroom is located forward and offers a v-berth with insert, 4 portholes with curtains and overhead hatch for plenty of natural light and ventilation, hanging locker, storage cabinet, drawers and shelves, reading lights, teak parquet sole, fan, anchor chain locker access and ensuite head. 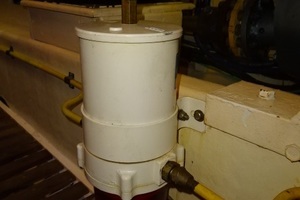 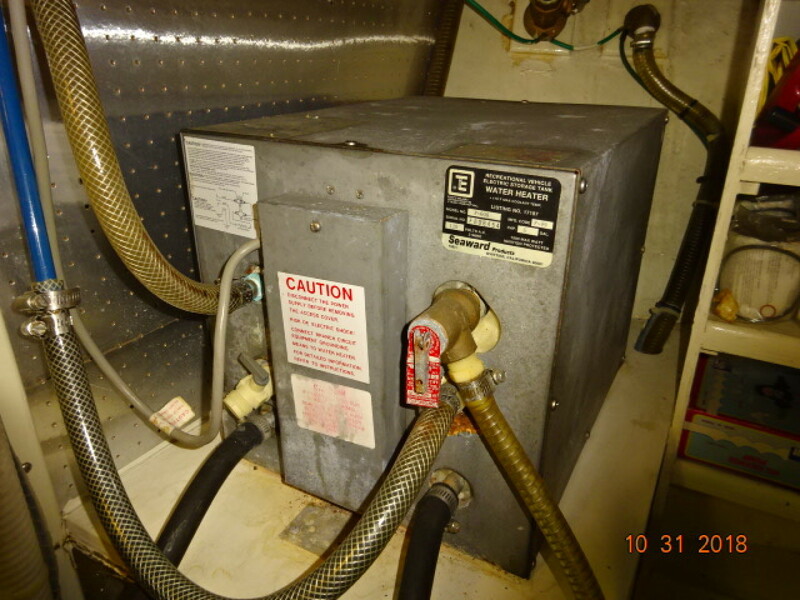 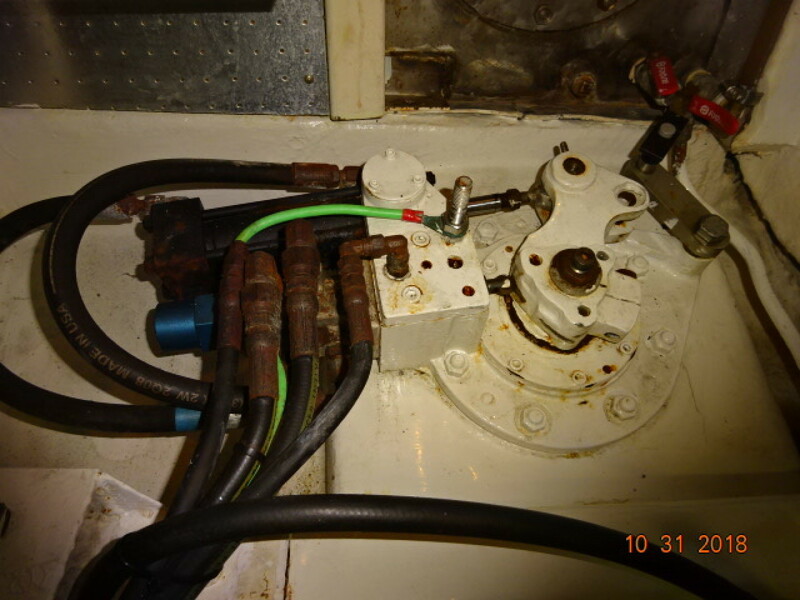 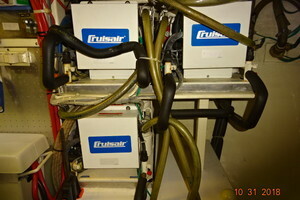 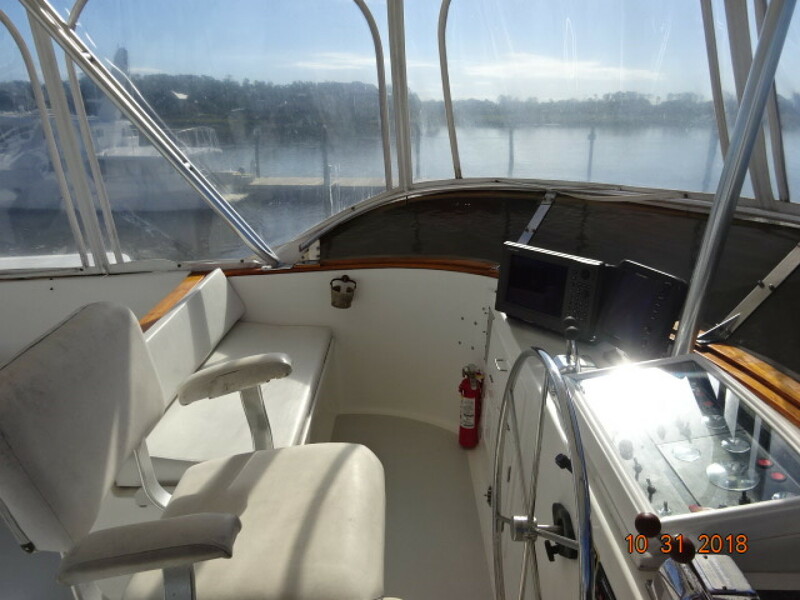 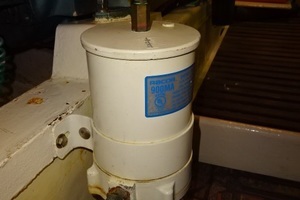 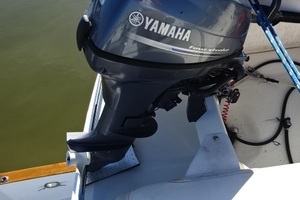 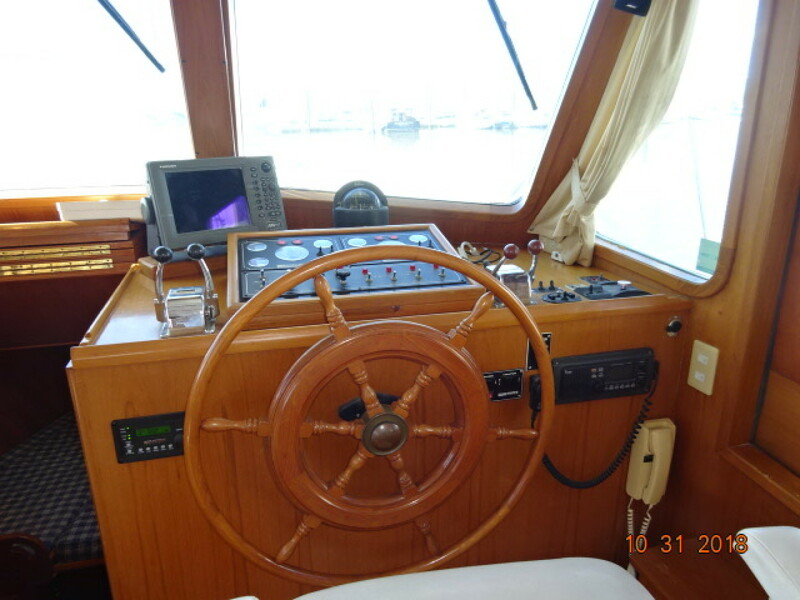 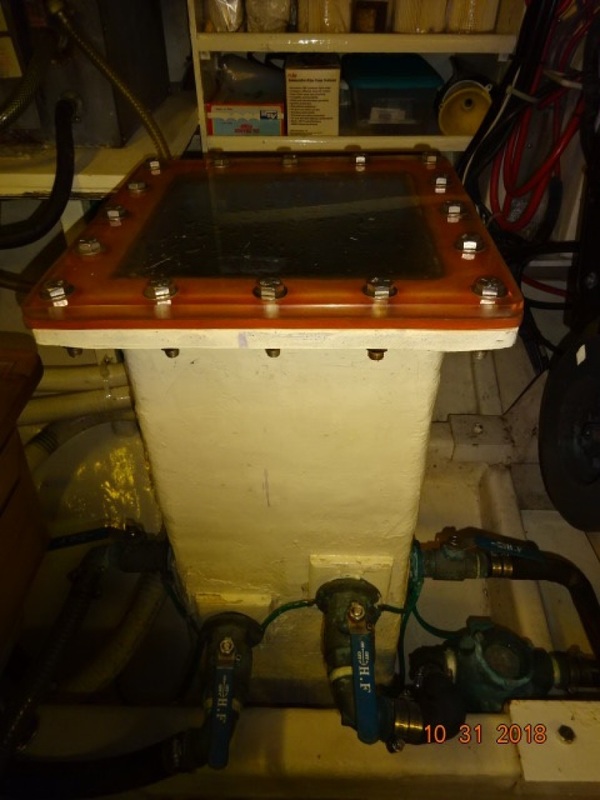 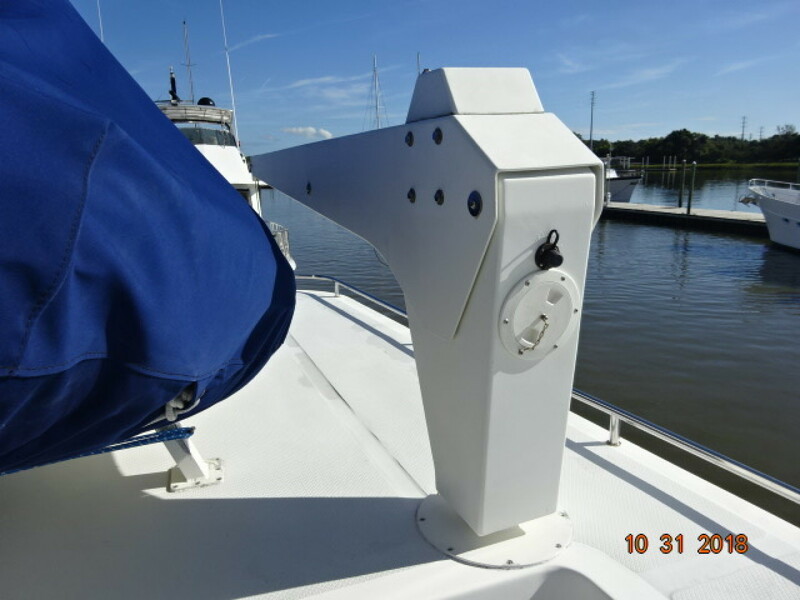 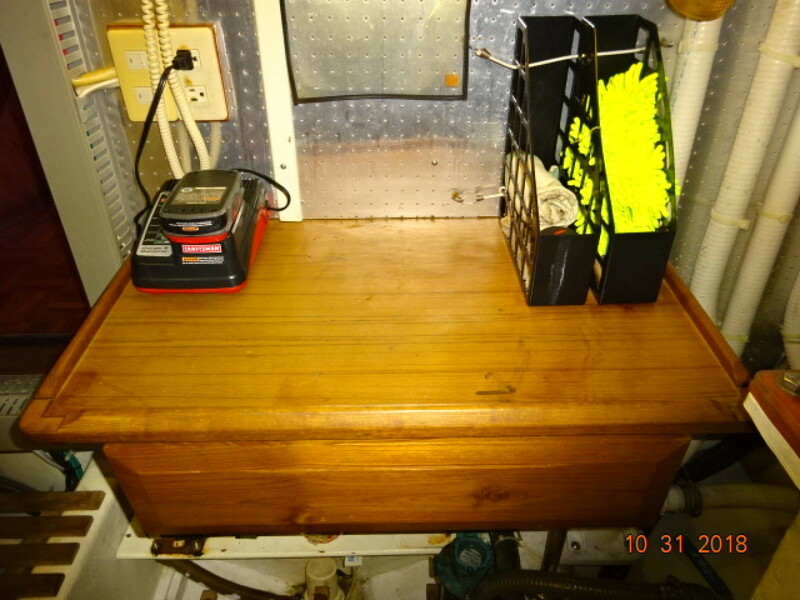 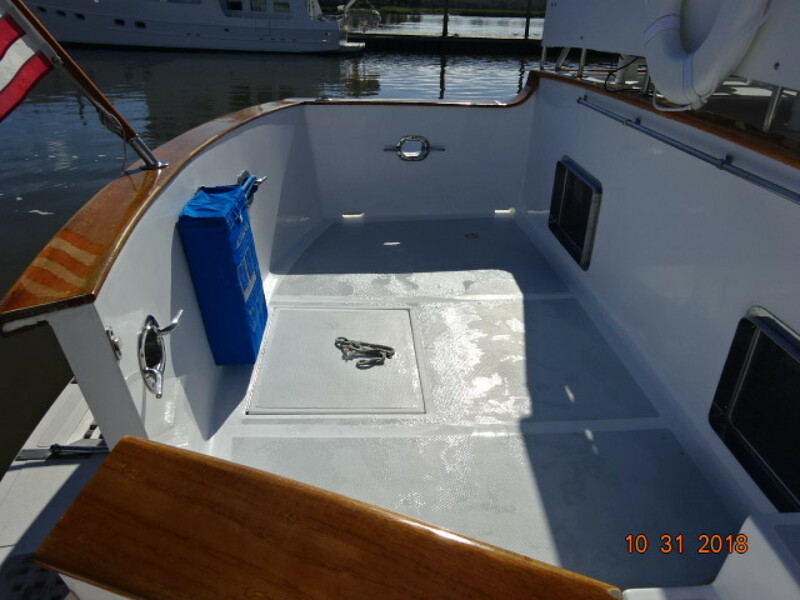 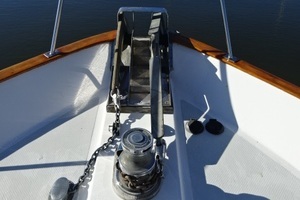 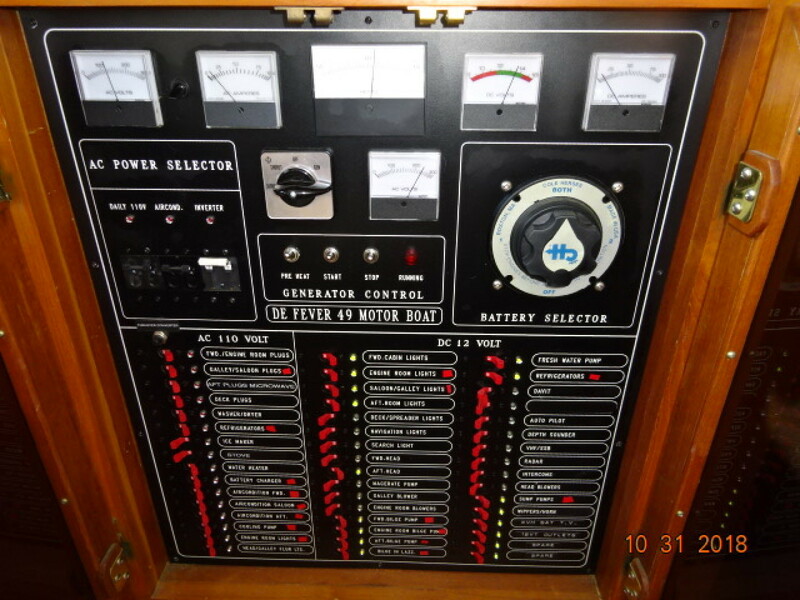 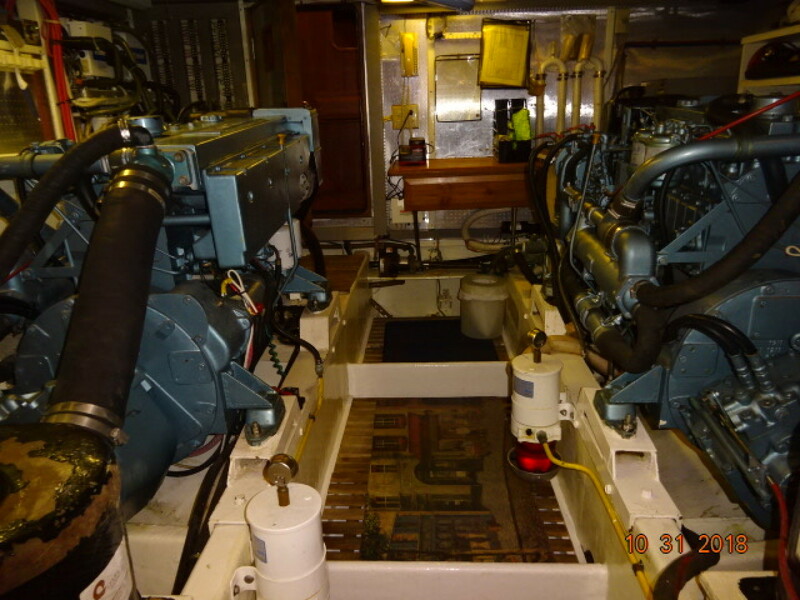 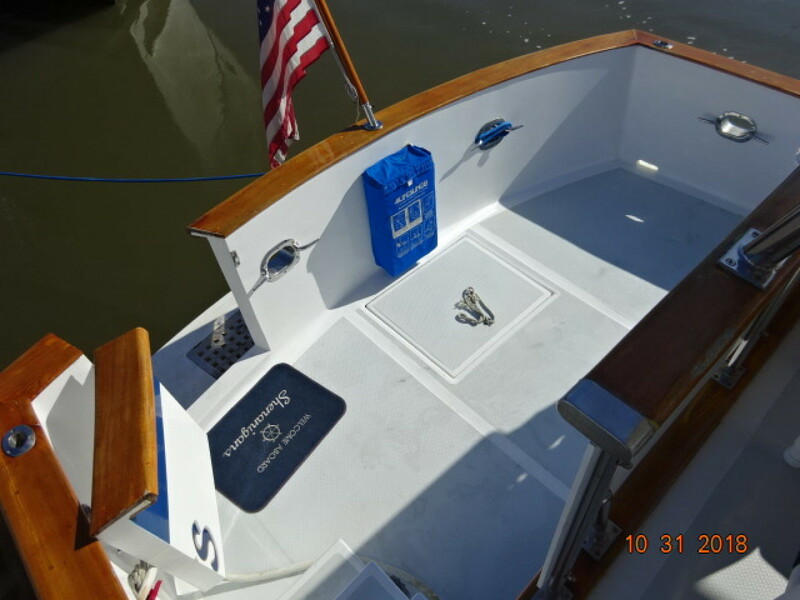 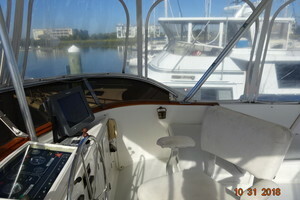 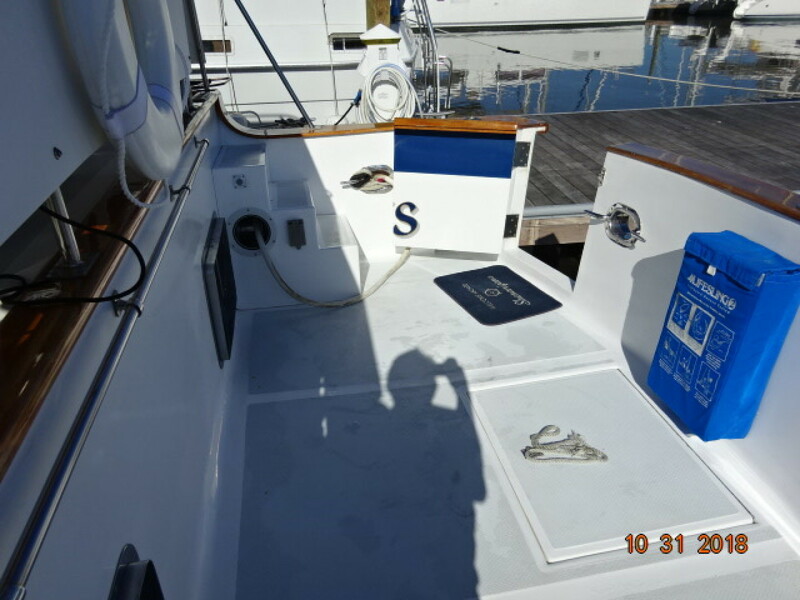 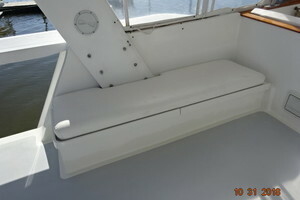 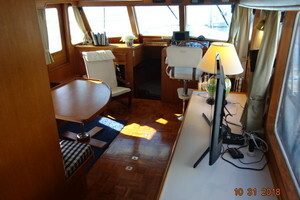 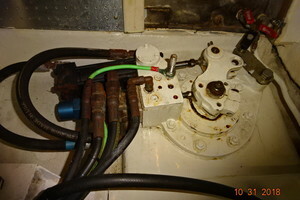 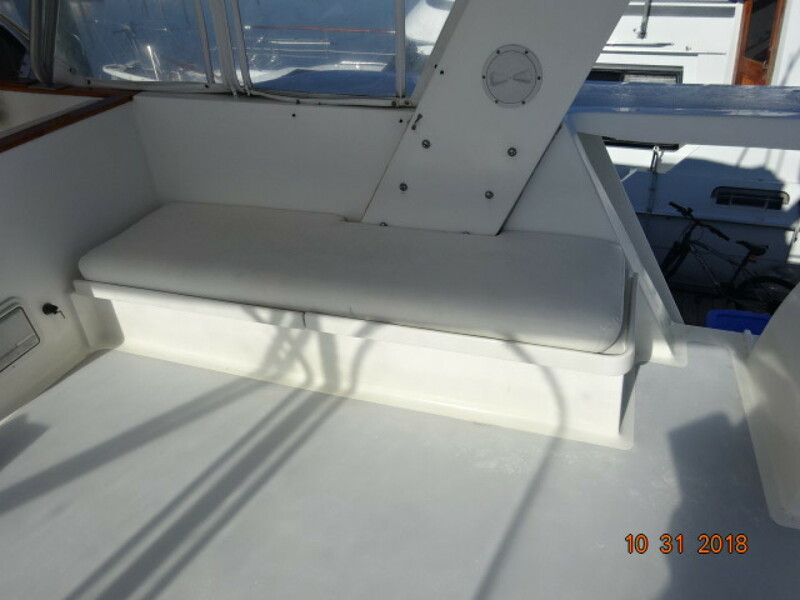 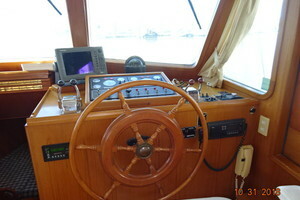 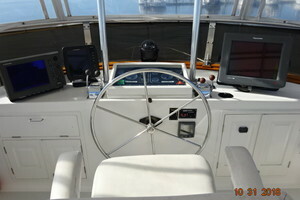 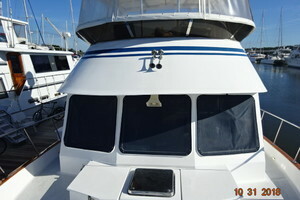 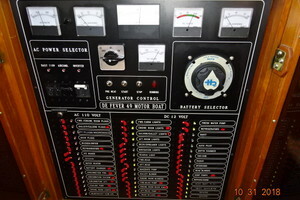 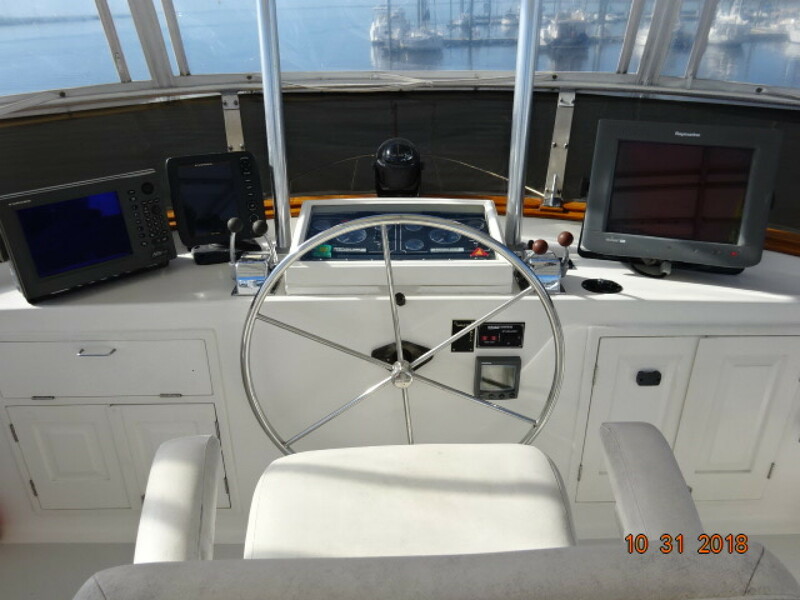 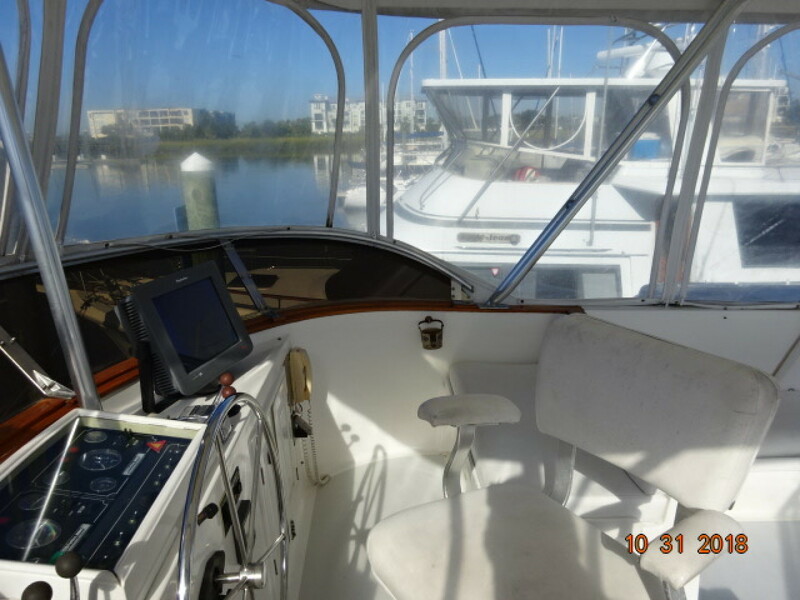 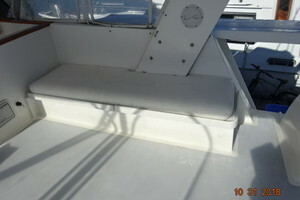 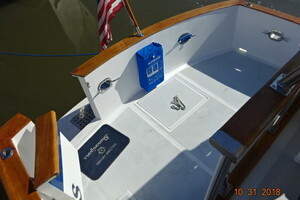 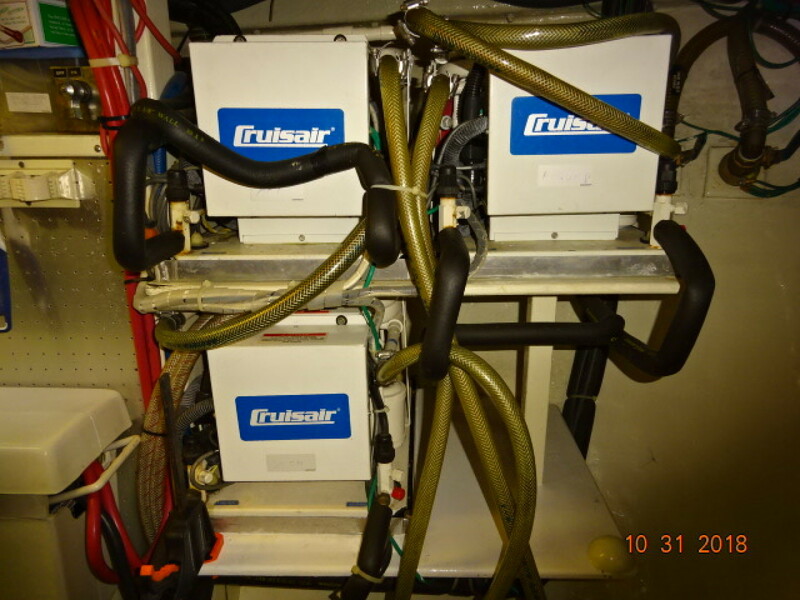 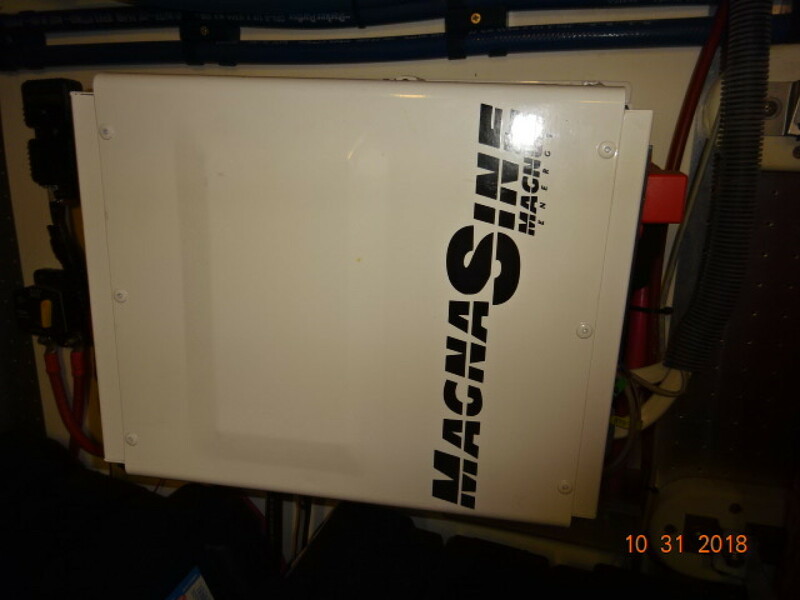 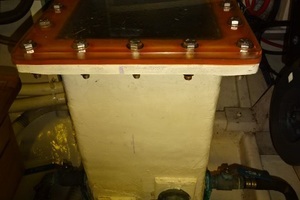 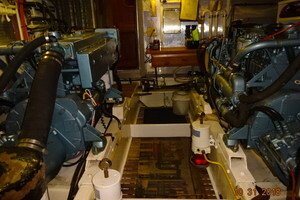 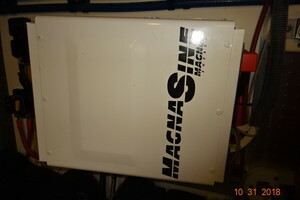 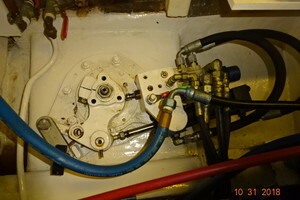 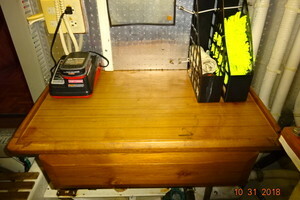 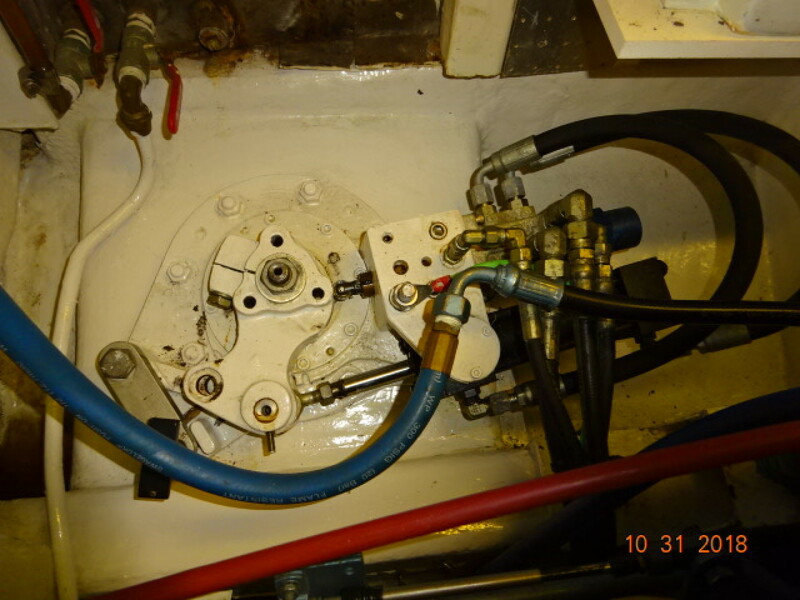 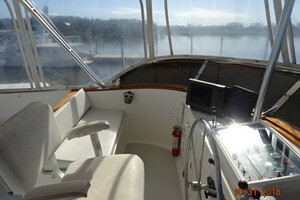 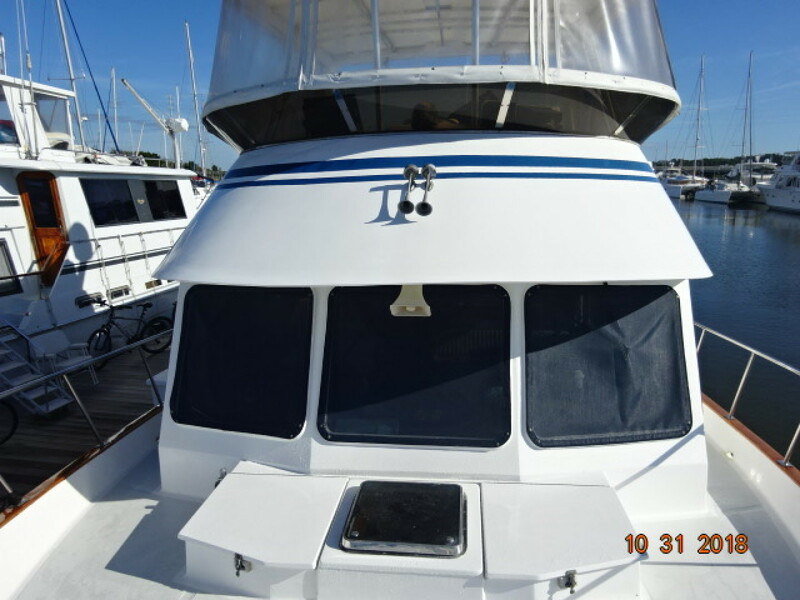 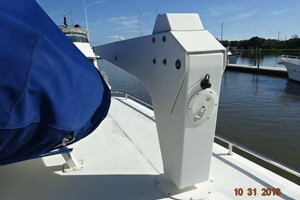 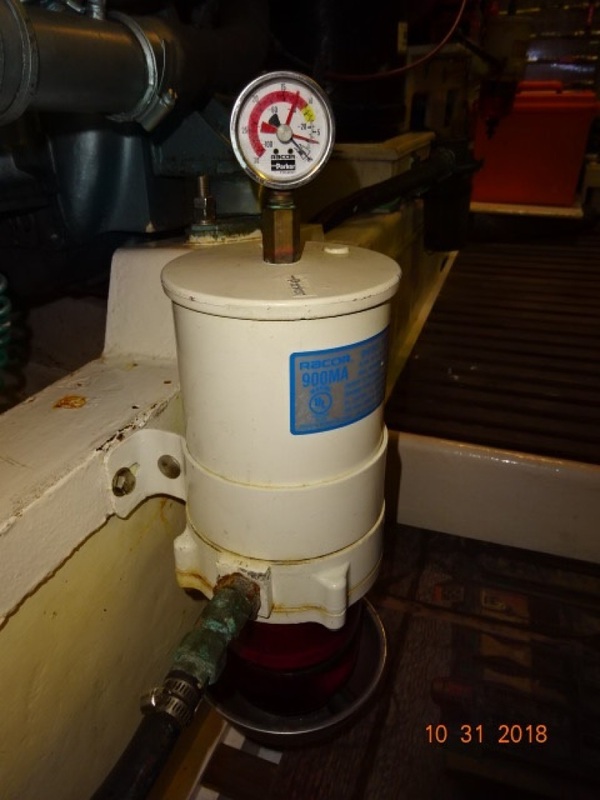 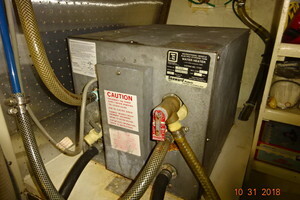 helm seat, chart drawer and counter to port and starboard side deck access door. 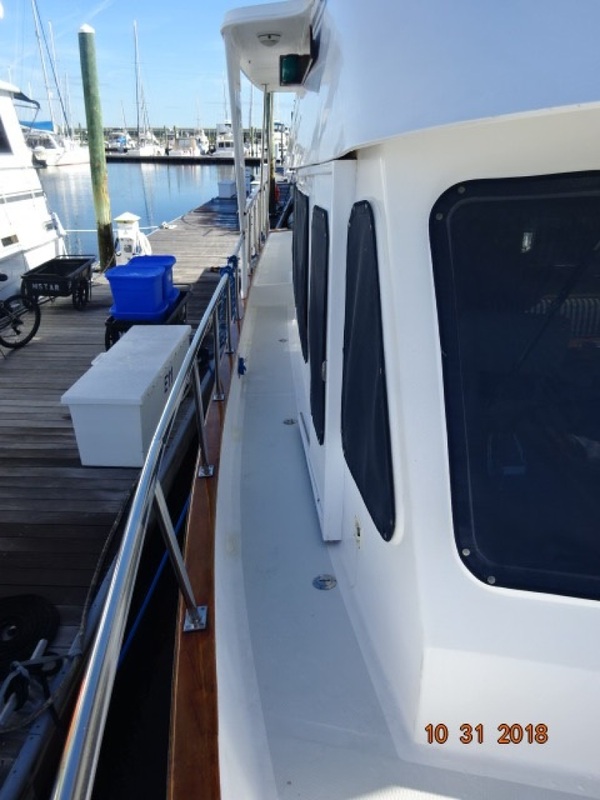 The huge flybridge offers an aluminum frame and canvas top, radar arch, Eisenglass enclosure, non-skid deck, helm forward with storage underneath, Pompanette helm seat, benchseats forward on each side and benchseats aft on each side, all with storage underneath. 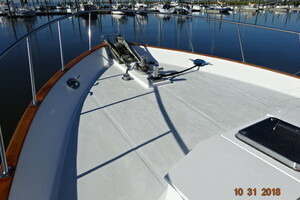 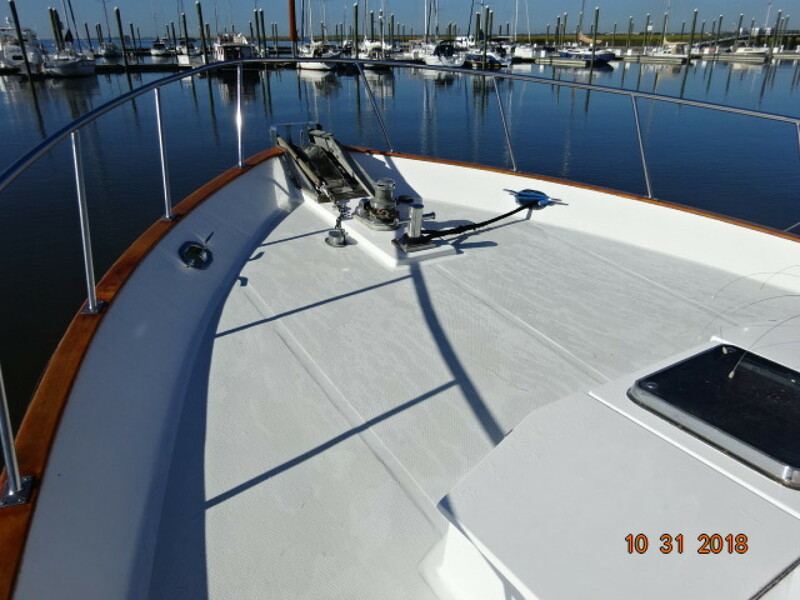 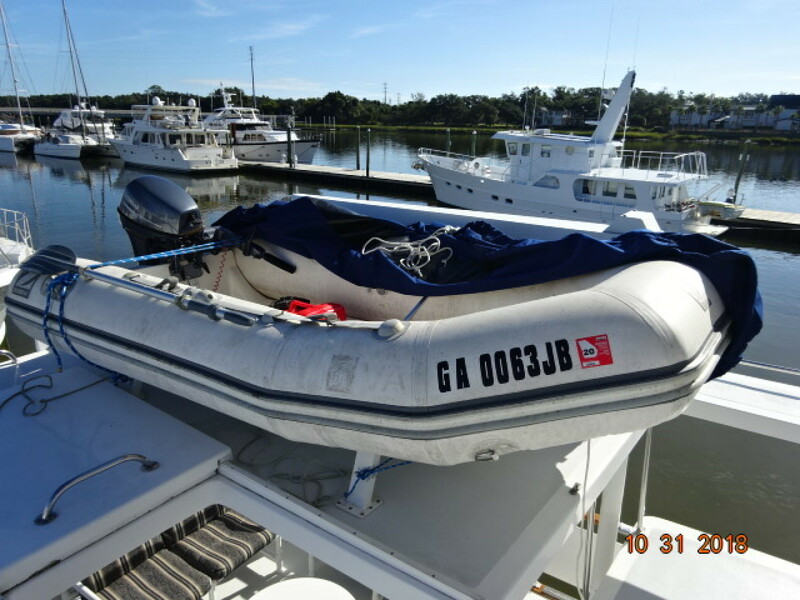 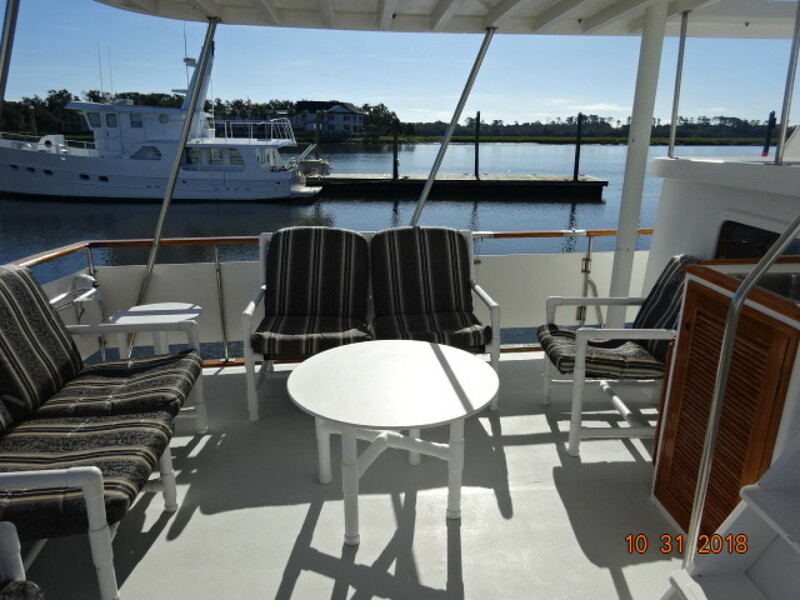 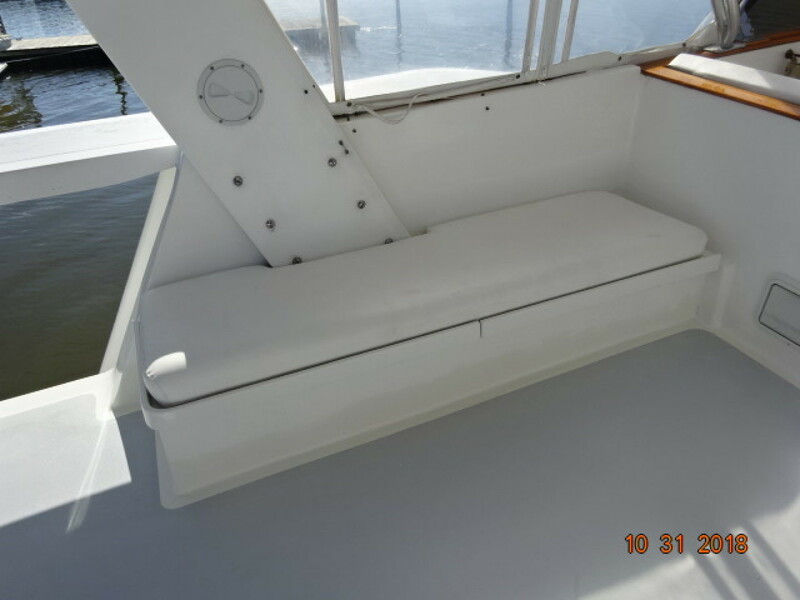 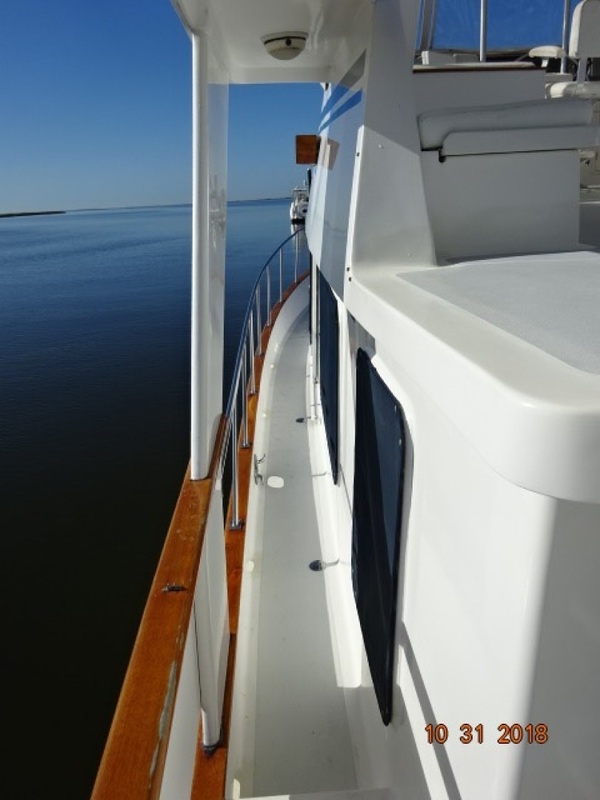 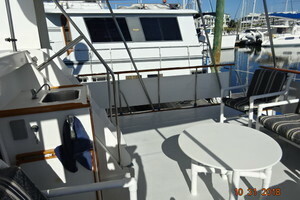 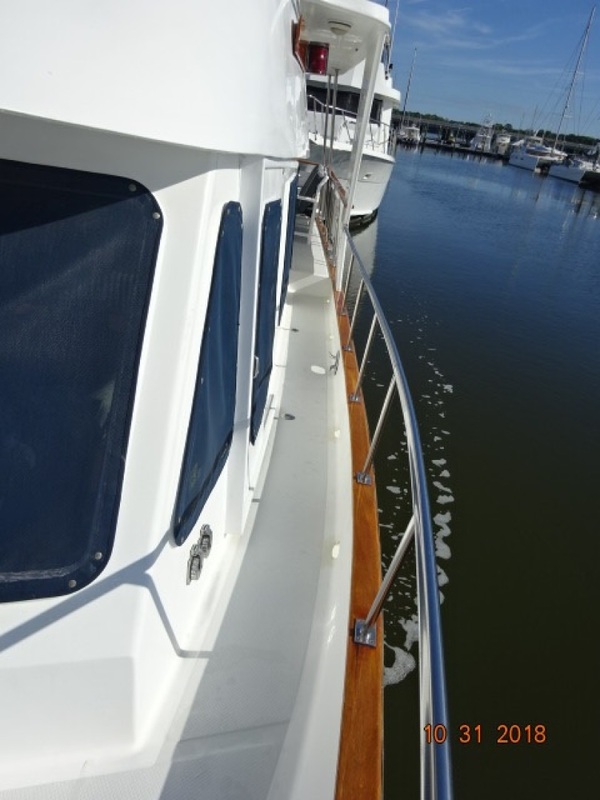 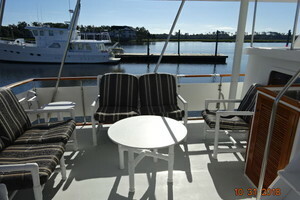 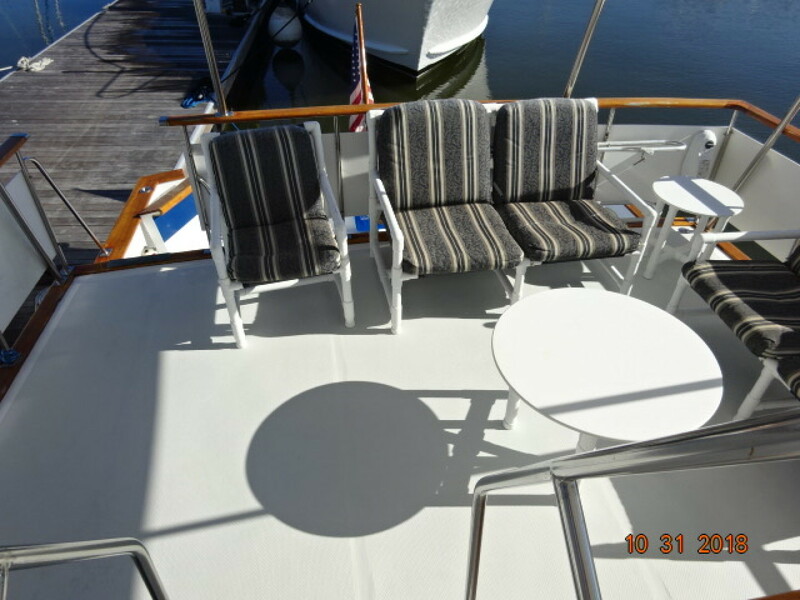 The 49' DeFever sundeck is famous for its size and easy access. 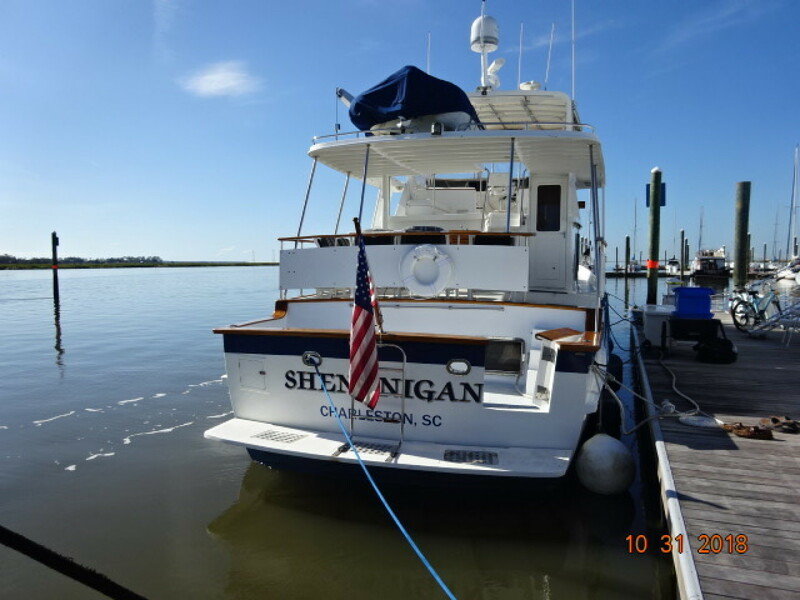 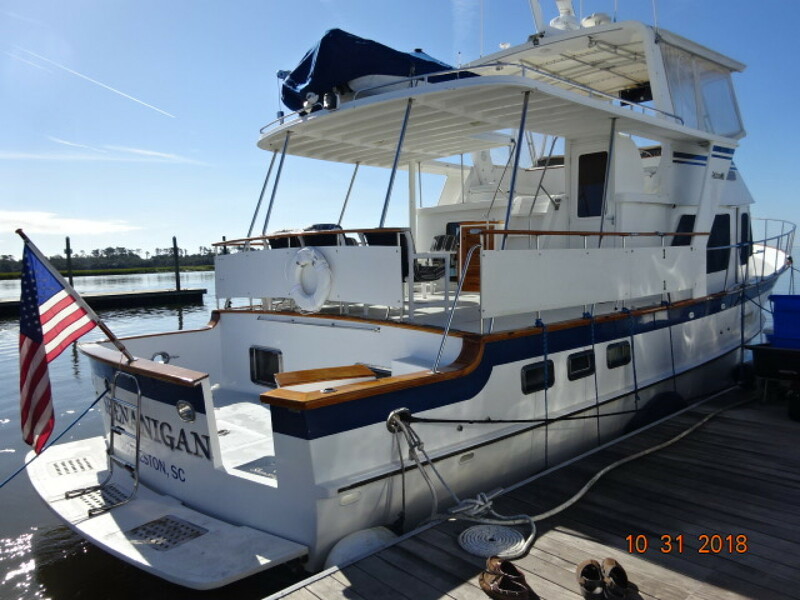 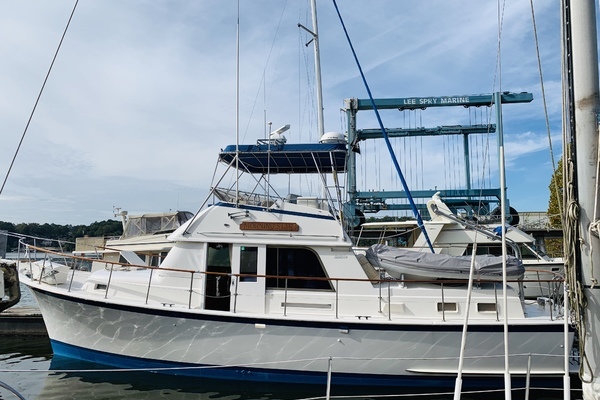 Shenanigans offers a non-skid deck, hardtop, wetbar with stainless steel sink forward, side decks access, four steps to the flybridge, 2 deck chairs, 2 deck sofas, two tables and bulwark gates on each side. 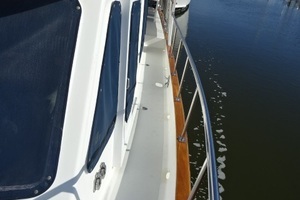 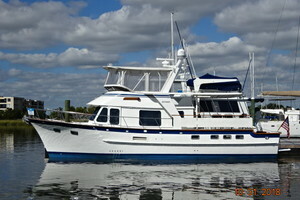 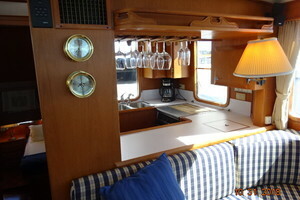 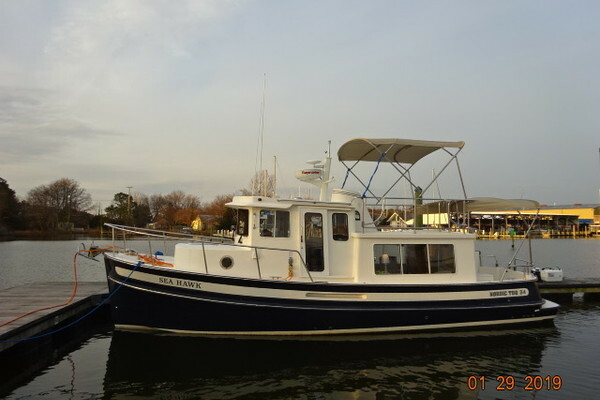 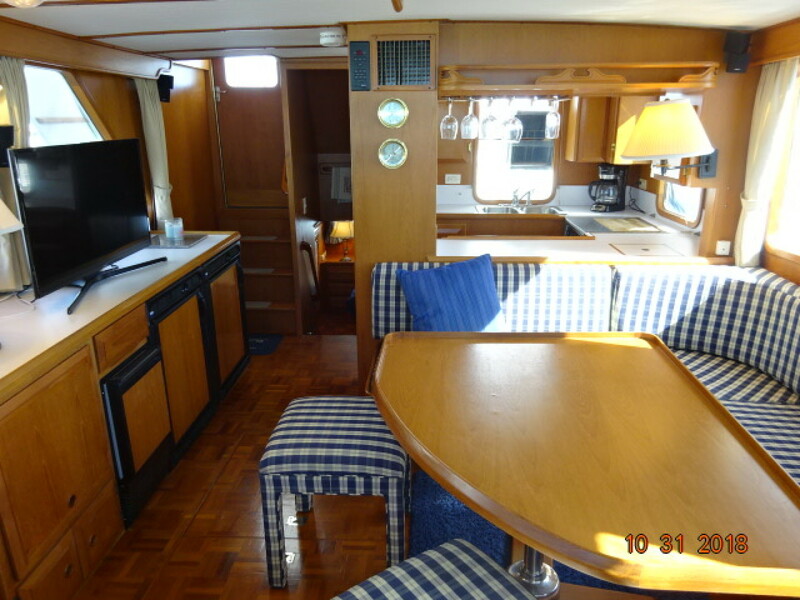 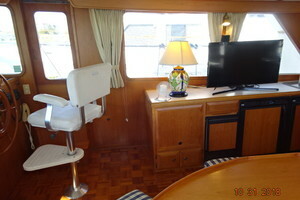 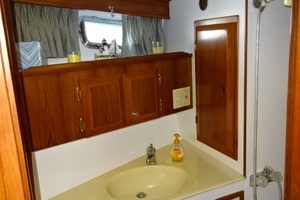 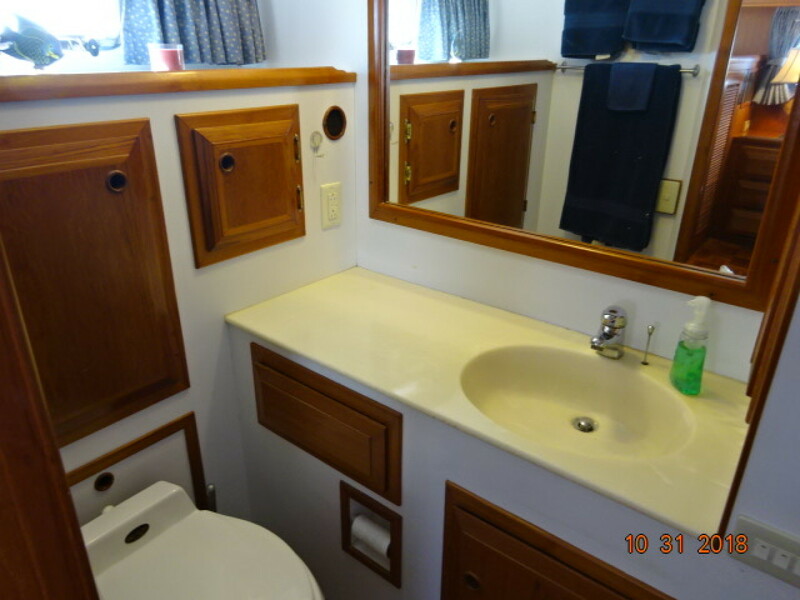 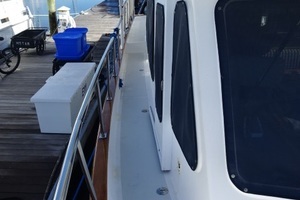 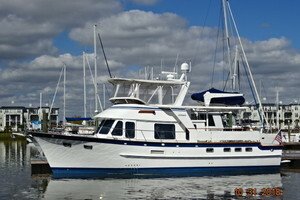 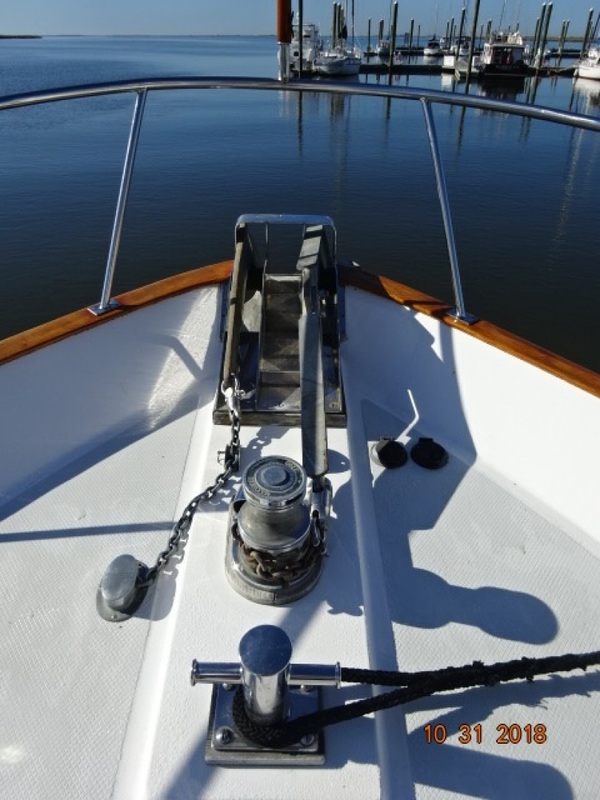 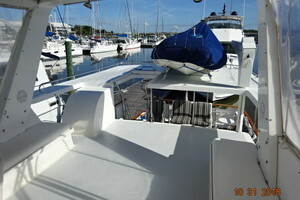 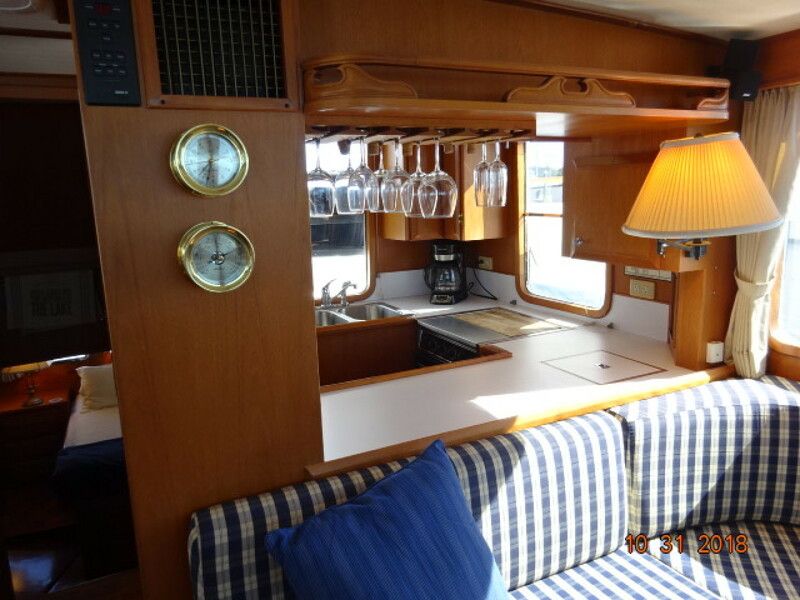 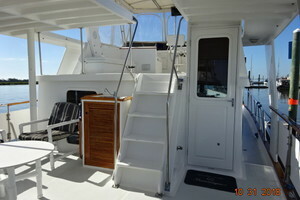 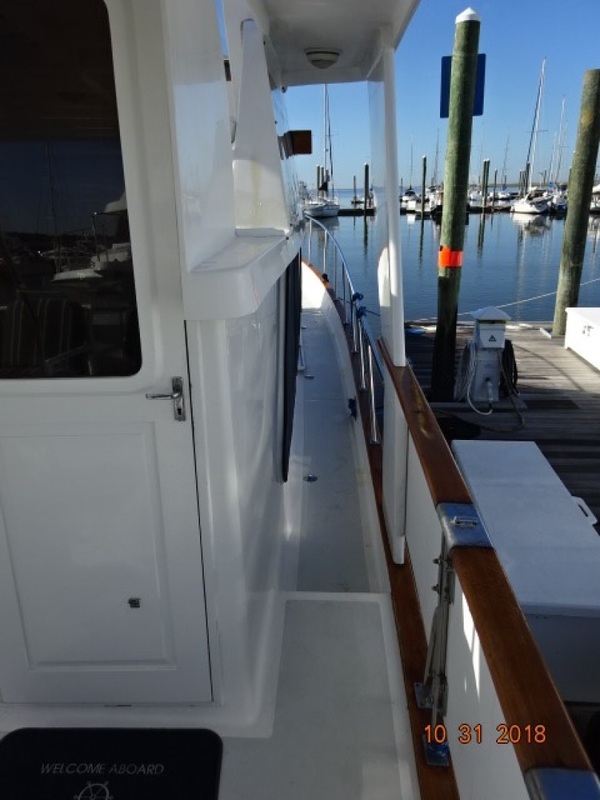 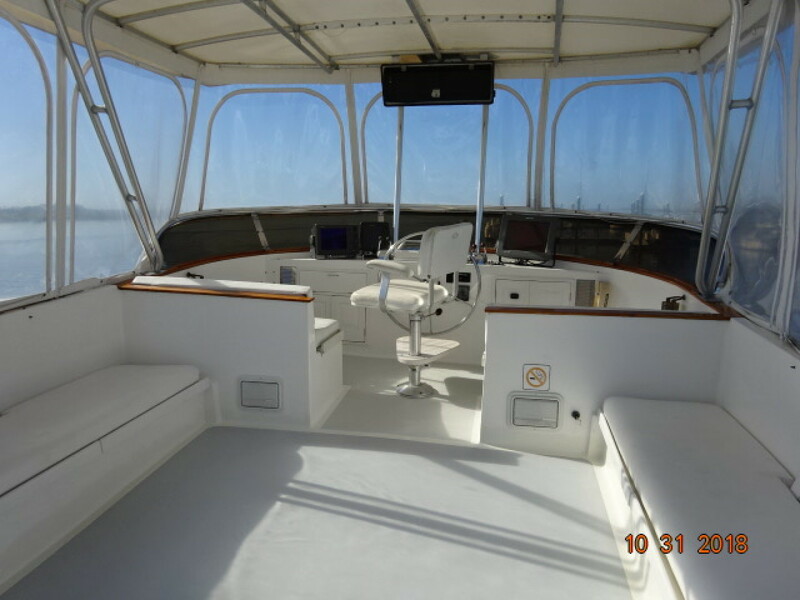 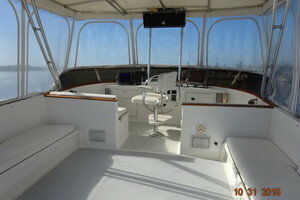 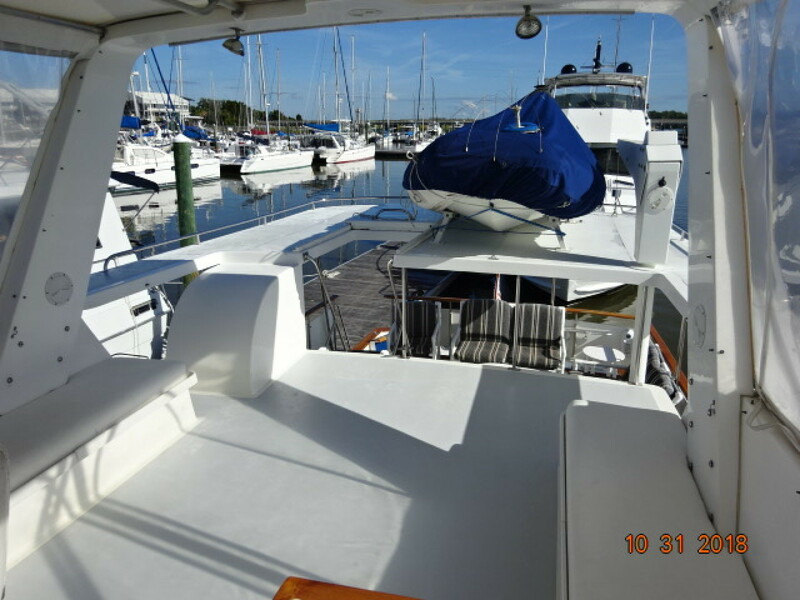 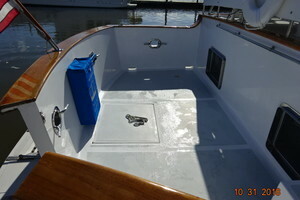 The large cockpit on the 49' DeFever offers teak cap rails, non-skid deck, transom door to the swimplatform, hot/cold shower in a transom compartment, lazarette access and 3 steps to the sundeck.